See that tag? Sweater inside out for two hours. Sigh. 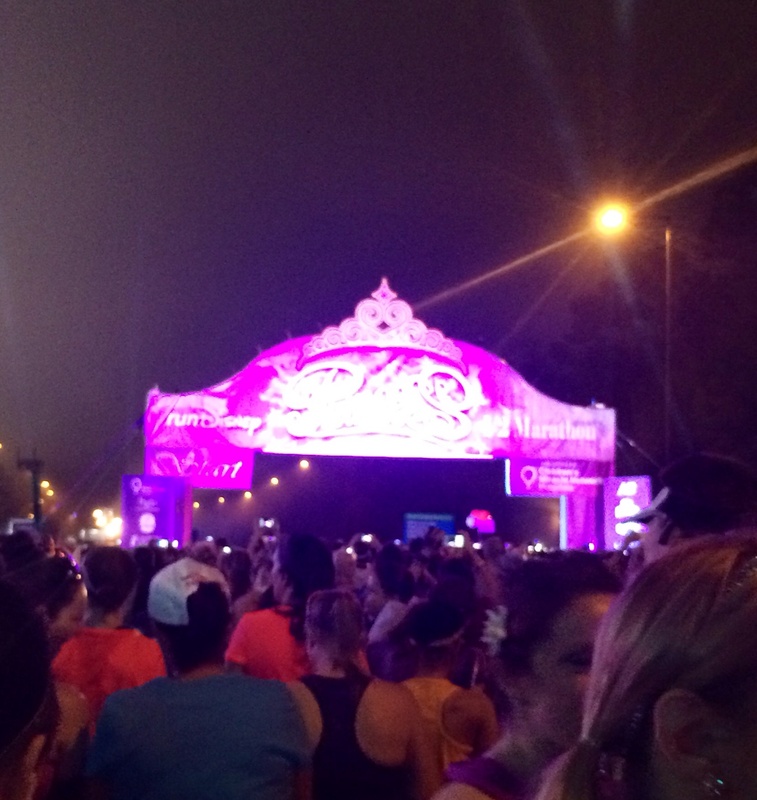 This week was registration for the Princess Half Marathon. 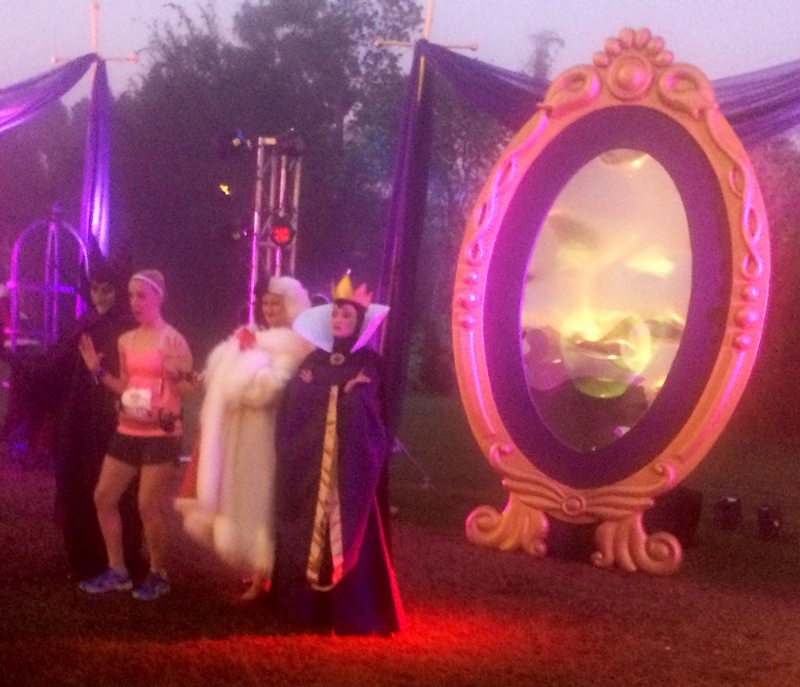 I’m not running this year, but loved it last year and hope all of you aspiring princes and princesses got registered! I’m looking forward to following along with your journeys. 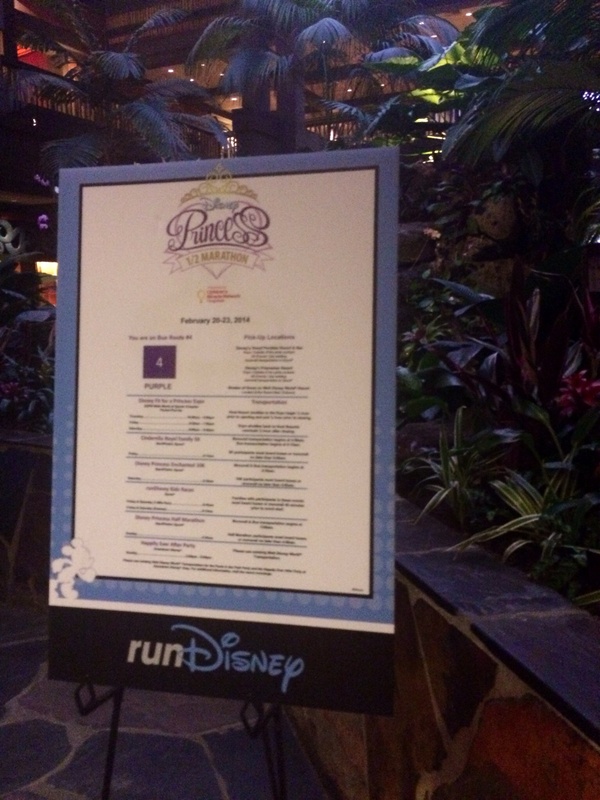 One book I read when getting ready for Princess was the Runner’s Guide to Walt Disney World, a travel guide specifically focused on those of us traveling for RunDisney events. I need to pull it out again to read about going out to DisneyLand! 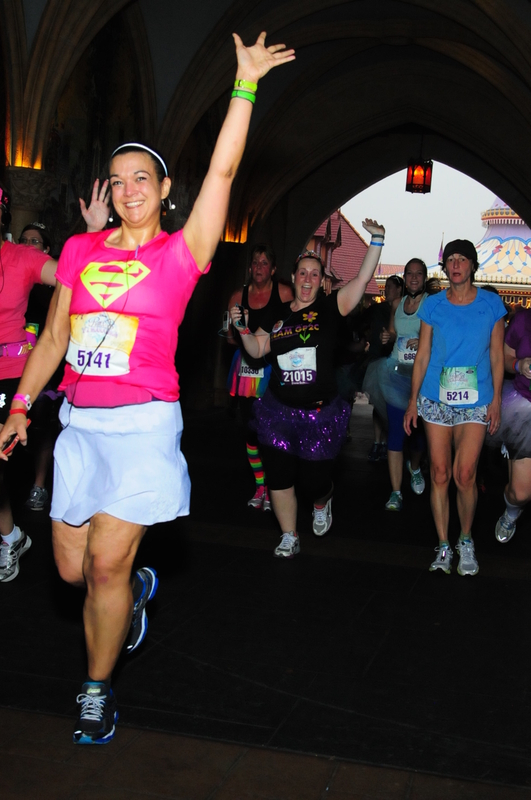 They’re doing surveys currently to gather experiences on the 2014 RunDisney events so far, so be sure to go fill out the surveys and help future RunDisney runners with your experiences! I am so inspired by Shelley, as someone who is maintaining her weight loss successfully and lives such a lovely, normal life while doing it. Sometimes I feel like I’m going to always be worried about what the scale says or what I’ve eaten for the day and on those days, I really value having someone who models successful maintenance to look to. She’s always honest about the ups and downs of it all, but doesn’t seem to be at war with herself or food and that is so refreshing. This week, she wrote about traveling without gaining weight (especially timely given my week away!) and I loved how uncomplicated it was. Taste everything, don’t eat it all, move. It seems so simple and as always, she gives me hope that I’ll get to the point where it is that simple more days than not. 🙂 I’d also secretly like someone like her to sit down and finally teach me to knit! We’ve talked before about how important it is to view this as a permanent lifestyle change, not a one time event. With that as my perspective, how I could I not absolutely LOVE this post from Dani at WeightOffMyShoulders this week! 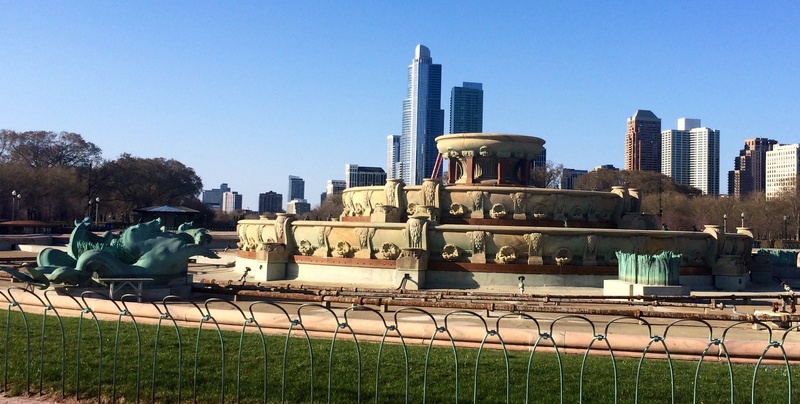 Then and Now is a much more realistic way to look at our progress than a Before and After. “After” implies that I’m done at some point and I keep setting new goals, so I’m never really “done” enough to be an “after”, am I? It all goes into defining success in a more meaningful and maintainable way. Thanks Dani! Today I’m waving goodbye to Montana! It’s been fun, but I’m looking forward to being back home with my guys. Send my safe and speedy vibes for my flights home! Pre-race: I wasn’t expecting a photographer there! 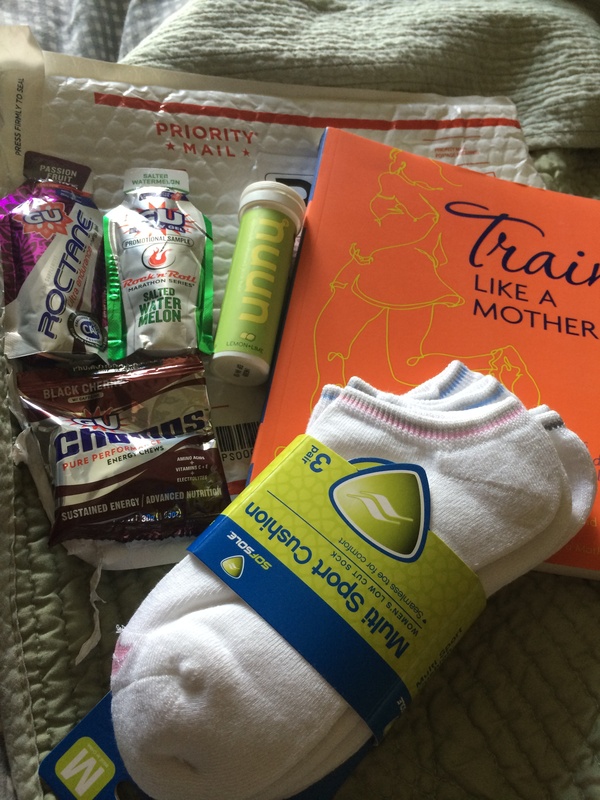 – Salted caramel Gu packets: I carried 5, to have to use before the race and then one every 3-4 miles like I’ve done with training, plus an extra for emergencies (like needing a boost or dropping one). I ended up using only 3, because I skipped the pre-run Gu and didn’t use the extra one. I contemplated bringing only 4 and using the Clif Gel offered on the course (and I had practiced with a Clif Gel – don’t use anything you didn’t practice with!) but decided to stick with I’d used most often. Of course, I did end up taking the Clif gel anyway, so I had 3 gel packets in my pockets when I crossed the finish line. I kept these in the waist pocket of my SparkleSkirt and they were readily available. – Ziploc bag containing Starbucks napkins: I sweat horribly, so the baggie was necessary to keep from soaking the napkins and the napkins served two purposes. 1) Toilet paper if needed on the course – didn’t need for this purpose, thankfully; and 2) Blotting paper for a slightly less sweaty finish line picture. Starbucks napkins specifically are great blotting paper in a pinch (as opposed to other napkins or tissues that might stick to your skin and leave bits of paper) and I used them quickly as I was coming out of Epcot. I carried these in one leg pocket of my SparkleSkirt. 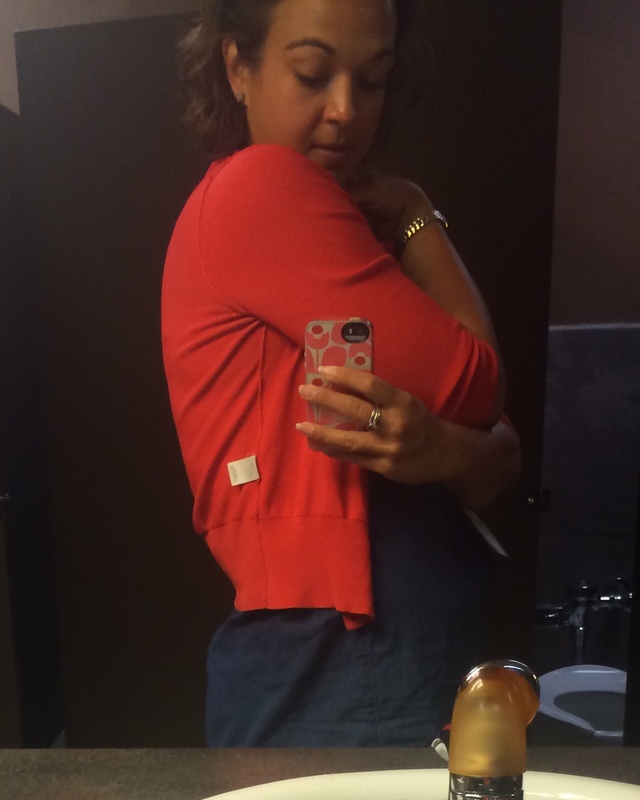 – My phone: Carried in a leg pocket of my SparkleSkirt, which tends to get less sweaty than my waist pocket. – My iPod Shuffle: Clipped on, with the headphones I use for all my runs in one ear and the other earbud hooked through my bra strap (and yes I practiced this way so I would know it worked and didn’t chafe – practice everything!). – RoadID bracelet: I always run with it and since I pinned my bib on before I actually got around to filling in my emergency contact information, I definitely needed to wear it. We never want an emergency to happen, but just in case, help your emergency responders as much as possible and give them the info they need like your name, age, allergies and emergency contacts! – Garmin: No question for me that I would wear it, just so I could keep an eye on my pacing and not head out too fast and burn out. – MagicBand: I needed it with me when I left the room, because I wanted to be able to get back in without waking my husband & son in case I forgot something and I didn’t want to leave it in my checked bag. *Thanks to a tip from the Expo talk I attended, I was sure to body glide under all of the things on my wrists! This is me running down Main Street and it cracks me up, especially when paired with the very blurry pic that ended up on my phone in this moment. – Eye drops: I wear contacts and sometimes have issues with them if I put them on super-early in the morning, so I carried eye drops in my SPIBelt just in case. – Spare phone: I have a second iPhone for my job and I actually carried it in my SPIBelt as well, in case the battery ran out on my primary phone between using it for GPS tracking and for pictures/texts during the race. My primary phone did fine, but I’m still happy with my decision to have both phones giving the large amount of time I was using the phone between the pre-race festivities and the race itself. For a half marathon with fewer hours of busy work before the race, I would probably have only one phone. – Lip balm: I hate having dry lips. I don’t think I actually used it in this race, but have used it on long runs before and always carry it along. 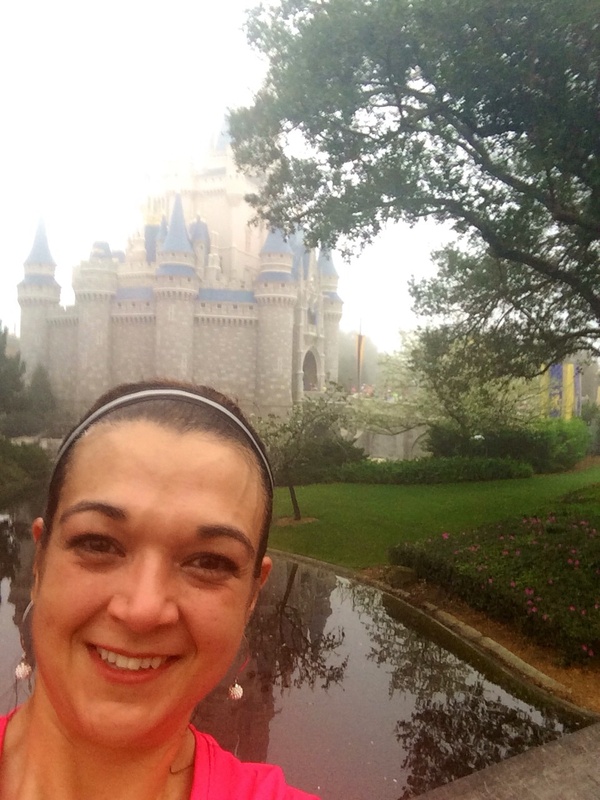 So cool to actually run through the castle! 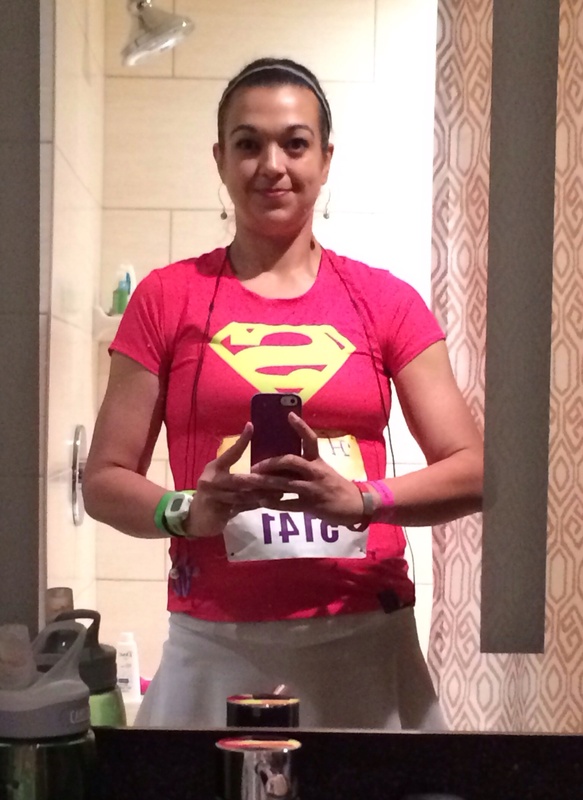 – Small container of vaseline: I was so terrified of chafing during my first 10K, since it was my first “big” race, that I carried a small amount of vaseline with me just in case I needed a touch up. 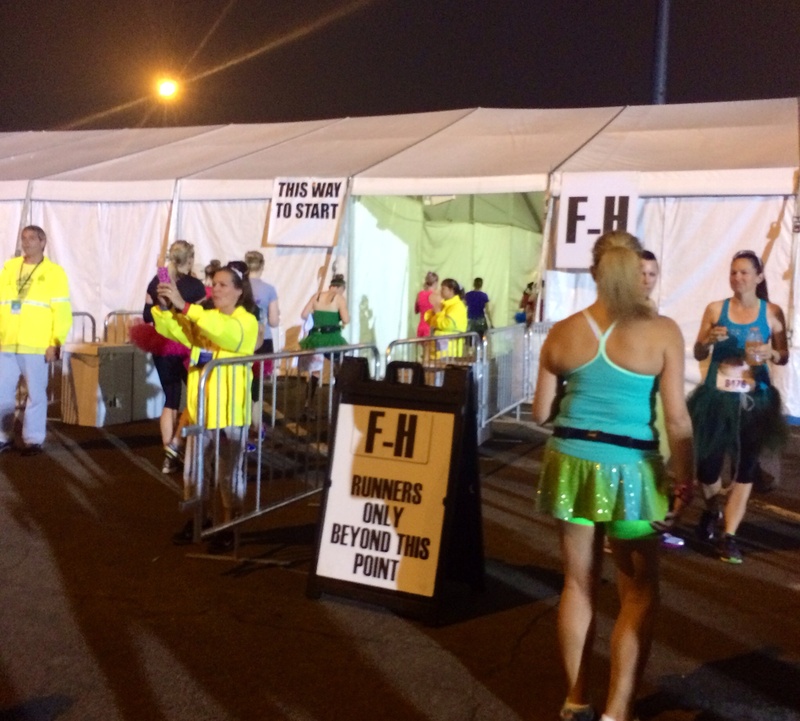 That’s not an issue with the runDisney events as there is vaseline at the med tents and I knew that ahead of time, so I left the vaseline behind. I’m also really liberal with BodyGlide so I’m not as worried about chafing now anyway (knock on wood). For the DesMoines half marathon in October, I’ve heard they have fantastic on-course support including med staff on bicycles who traverse the course to be sure no one needs anything, so I’ll probably skip it then too. – Band-aids, carried for the 10K and left behind this time for the same reasons as the Vaseline. – Back-up charger: I have a small portable charger for my phone that could recharge the phone without a wall plug. I had that on the list originally, but decided to go the two-phone route instead and I’m happy with that choice. I did have the back-up charger in my checked bag and plugged my phone in post-race, although even that wasn’t needed as the Race Retreat tent had a charging station. – Camera: I considered bringing a small camera, instead of using my phone for photos, but ultimately didn’t since I knew I’d have my phone anyway for GPS and texting purposes. While the camera would have given me higher quality pictures, I loved being able to text photos to my husband from my walk breaks to make him feel part of the process. Ultimately, I think for my next half marathon in Des Moines, I’m going to stick with the things I brought on with me on the PHM course (with the exception of the second phone). Aside from the bulge in some of my photos, it didn’t bother me to carry any of the things I had with me thanks to the pockets of my SparkleSkirt and the SPIbelt. Yes, I probably still over-packed but it was a comfortable over-pack. 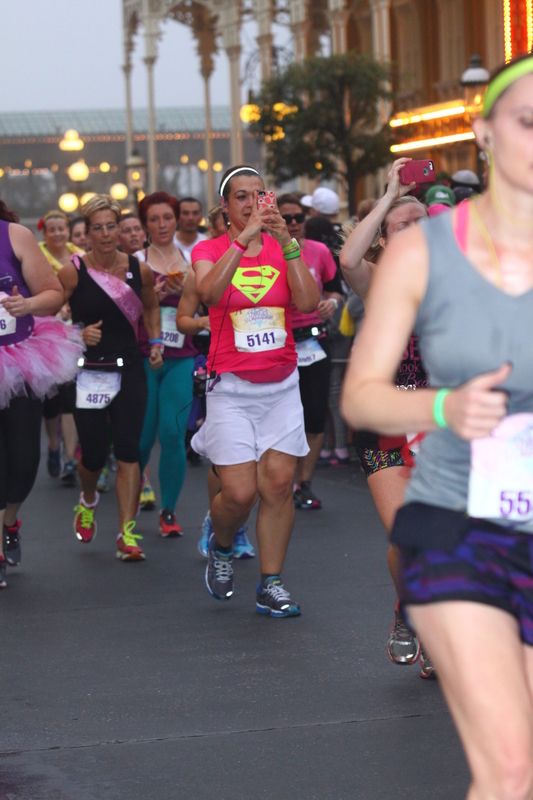 I cannot tell you enough how weirdly pleased I am with my race photos. All of the photos in this post are my official MarathonFoto pics. I’m not sure if they are really that objectively good or if I am just happy about them because they document such a happy experience for me. It is an odd place for me to be, enjoying photos of myself. I have historically hated to get my picture taken because while I’m not unattractive and I know that, I’ve never felt like I was photogenic and I’ve honestly always hated being confronted with how fat I was any time I saw a photo of myself. At our wedding, I told my husband he was in charge of deciding on a photographer because I could not bring myself to spend so much money on something I knew I would hate. (Thankfully, I didn’t tell other people I wasn’t interested in a wedding photographer because that probably would have caused even more uproar than my suggestion of skipping a bouquet did!) We get family photos every year because I love having pictures of my son and my husband, but I’ve really never enjoyed pictures of myself, so liking these pictures is a new experience for me. I look at them and see a woman full of strength and joy and maybe I’m finally starting to believe that woman is me. was able to enjoy the vacation we’d spent so much time and money on. To help achieve this, we decided to schedule a sports massage at the Grand Floridian Senses Spa on Monday morning. I spent a little time reading about the optimal timing for massage after a big running event and the consensus seemed to be that a brief massage immediately after the event or a more intense sports massage 24-48 hours after the event (although there were lots and lots of conflicting opinions, so who knows what is really best!). Earlier than 24 hours, many people experience more pain as a result of the massage because your muscles are too early in the recovery process (inflammation, metabolic byproducts still present) and further physical manipulation is uncomfortable. The other important piece of advice I took to heart was finding a massage therapist that was experienced in dealing with massage in athletes, rather than a massage for overall relaxation (not that those aren’t lovely too!). Thus, I decided to spend Sunday after the half marathon walking around and hydrating to help my muscles recover and then go for the massage Monday morning. I’ve used the Senses Spa on the Disney Dream, but this was my first experience with one of the spas on Disney property itself. I chose the Grand Floridian because I could easily walk to the spa from the Polynesian. The cost for the massage at Disney was definitely more than I would have paid at home for the same service ($174 including 20% tip for 50 minute sports massage), but I was expecting that based on the costs of the spa services on the cruise and because it’s Disney – I’m used to paying a premium for their products. 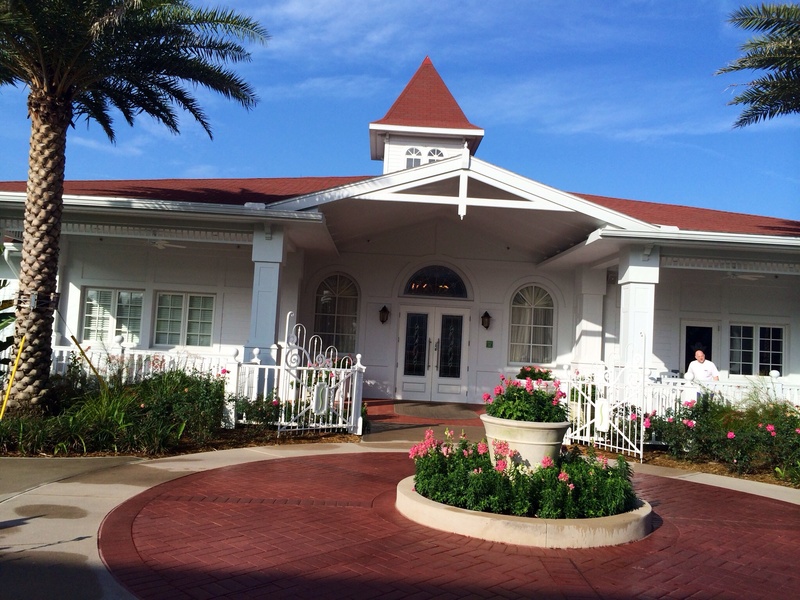 The Grand Floridian Senses Spa is not in the main Grand Floridian building. Rather, it is in a small white building off to the side near the wedding pavilion. This building also houses the small workout room shared by the Polynesian and Grand Floridian (that room has a separate entrance). Upon entering, the staff was very welcoming and the check in process was very smooth. I didn’t have to complete a medical history form like I have for other massages, but I may have filled something out online at the time I booked the treatment that I’m forgetting? I was able to pay with my Magic Band and was quickly whisked back to the locker room. There was a 20% tip already added to my bill at the time I paid and signed before the procedure. I assume you could adjust that after the treatment if you needed to, but I didn’t attempt that. The building was very quiet, with low lighting and soothing decor. According to the survey I received after the spa visit, the Senses approach is to provide total relaxation, beyond just the service you are paying for. This wasn’t articulated by the staff handling my check in or my therapist, but I could definitely see that they put a lot of effort into creating a soothing environment. 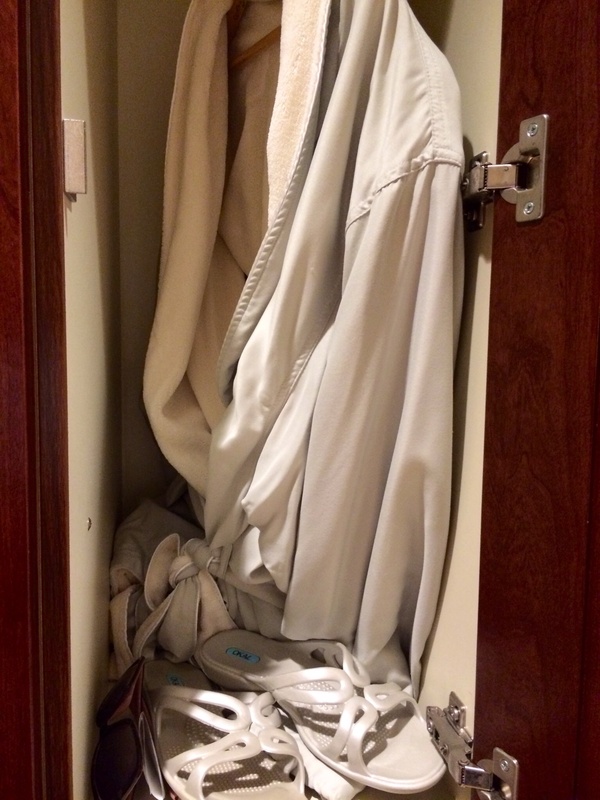 You are given a locker, stocked with a robe and slippers. The lockers allow you to set a combination, similar to a room safe, so that you can leave your belongings safely in the locker while receiving your treatments. 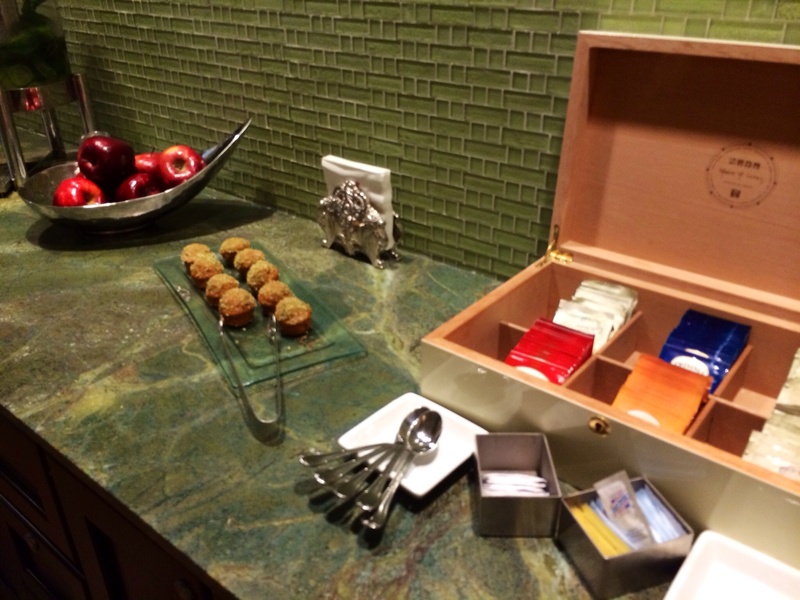 There is a small waiting area, with lounges, privacy curtains, water, tea and a few snacks. I loved the cucumber/basil water. The massage therapist very quickly came to get me and bring me back to the treatment room. 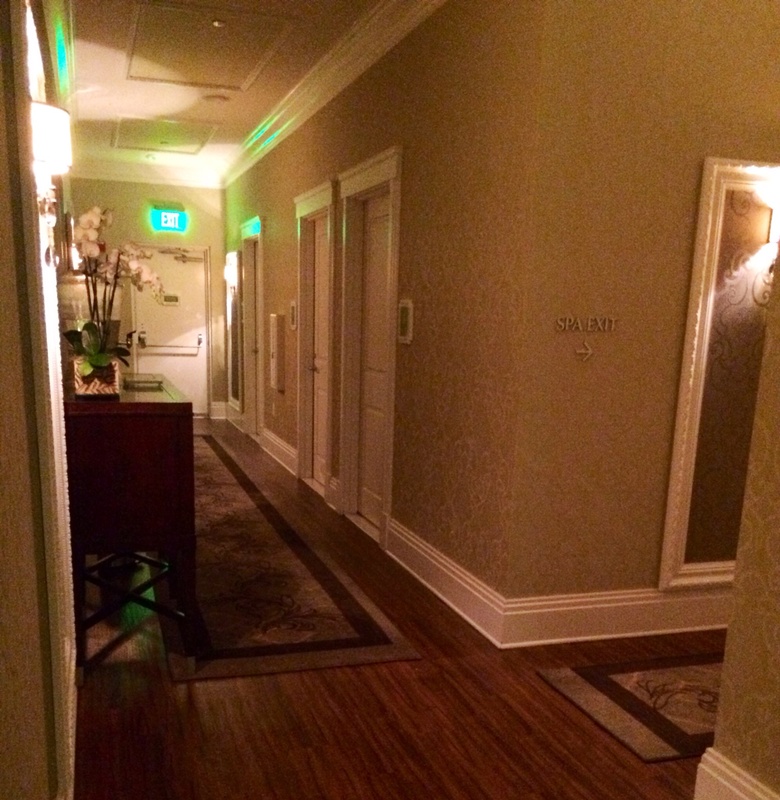 The treatment rooms were very nicely appointed, but similar to every other massage room I’ve entered. 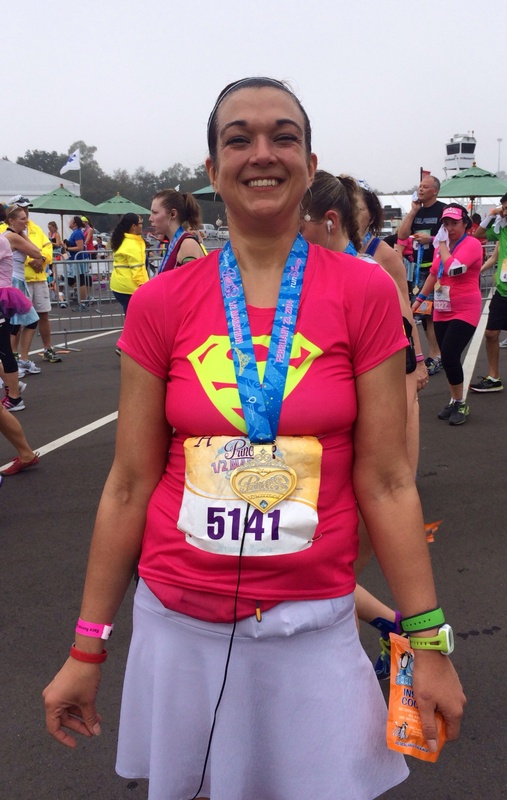 The therapist asked me about any particular areas of concern that I had (in my case, my shoulders from hauling around a 2.5 year old and my legs after the half marathon). It was neater than that before I thought to take a picture! The massage itself was very thorough and I appreciated the time spent moving my extremities through their range of motion to isolate specific muscles as she worked. The majority of her time was spent working on my shoulders, with surprisingly little time spent on my legs. I’m not sure if this was because of the tightness she could feel in my shoulders, more than my legs or if she just ran out of time. She did seem very concerned about my shoulders though and actually gave me a sample of biofreeze on the way out to use on my shoulders throughout the week if I needed it. Upon exiting, I was also given a small jelly candy that was supposed to be an antioxidant supplement to help with muscle recovery as well. I’m not sure how much I believe that, but it was tasty. 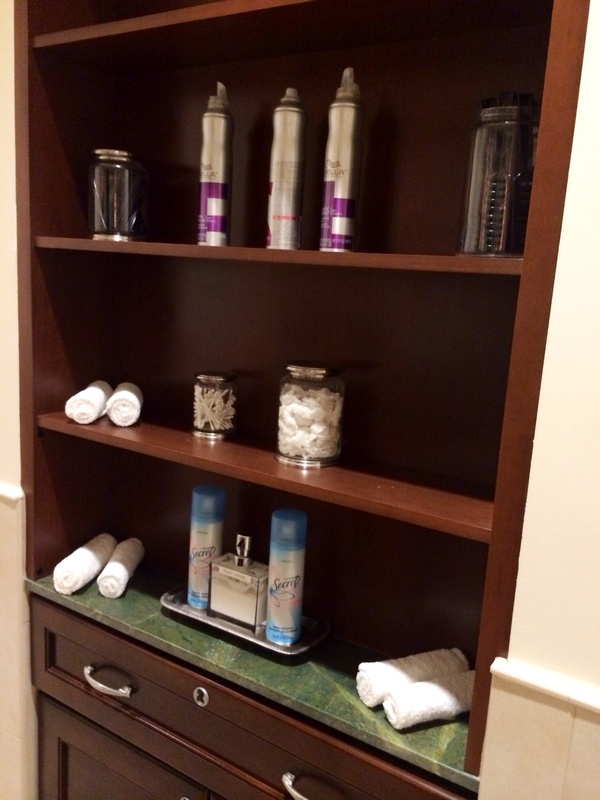 🙂 You are then returned to the locker room and lounge area, where there were showers as well as grooming supplies (including moisturizer, lotions, hair products, hair dryers, brushes, etc). There is also a steam room and hot tub that you can use, although I skipped those to go catch up with my boys in the Magic Kingdom. One thing that I did appreciate about this experience, as opposed to the Senses spa on the Disney Dream, is that there was no sales attempt for any products following my treatment. Overall, this was a relaxing morning but I am not sure how much it helped in my overall recovery. 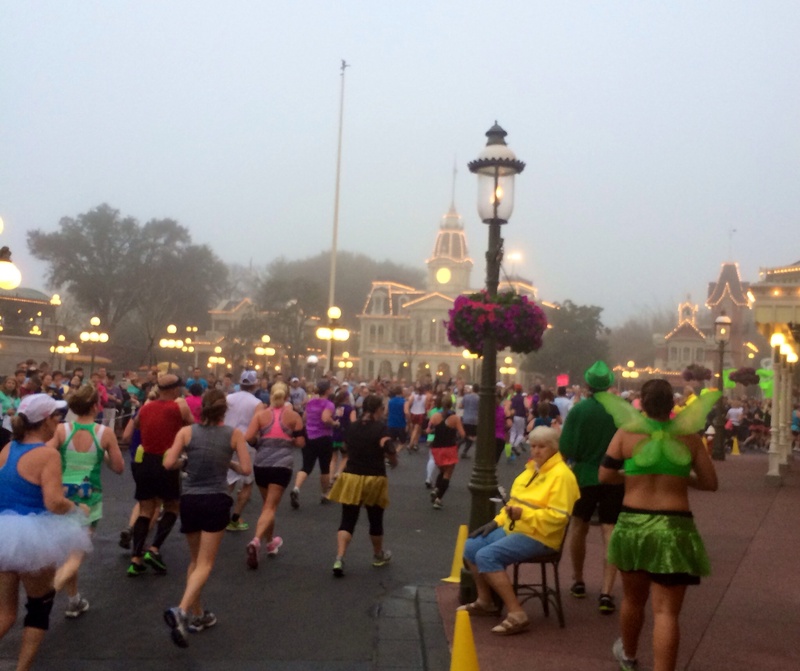 I was certainly able to walk around a lot following the half marathon with essentially no pain or fatigue – well, no fatigue beyond what we usually experience during a week traipsing through the parks! I think that my good experience in the week post-half marathon has more to do with my training and the stretching and walking I did on Sunday immediately post-race more so than the massage, but I would definitely recommend checking out the spa at the Grand Floridian if you’re just looking to splurge on a little pampering and relaxation time. Also check out the April edition of Runner’s World as it has a great article the reviews all of the evidence supporting massage for runners (as well as some great articles about running and weight loss). I found it helpful, after my 10K, to look back at my training plan to evaluate what did and did not work well during the process. I’m looking back now at my half marathon training and the race experience itself so that I can make notes for future reference for my next half marathon. Had I mentioned that yet? I signed up for the half marathon in Des Moines in the fall to see how I can do in a less crowded, less humid and hopefully non-broken toed half marathon! and ended up with an extra week of training. 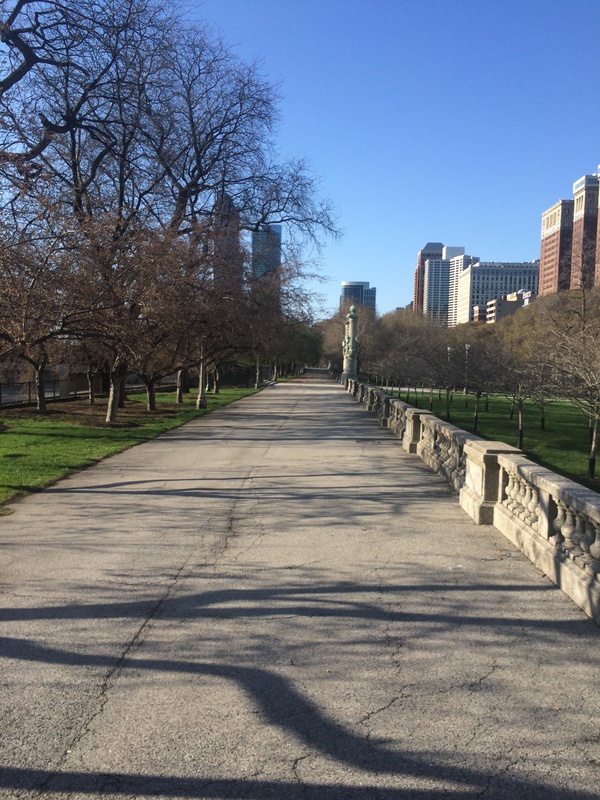 With the Higdon plan, the long runs on the weekends steadily increase in mileage as do the weekday runs, ultimately coming up to 5 miles on weekday runs. I felt very prepared to travel 13.1 miles after finishing this plan. I wasn’t concerned that I would not be able to complete 13 miles on race day having gone to only 11 miles in training. I think the longer weekday runs definitelyhelp in that respect, in building a strong cardiovascular base. From a motivation perspective, it was also huge for me to know that regardless of how fast I traveled, if I finished the race I was getting a distance personal record by finishing the half marathon. Every step after 11 miles, I celebrated that I was going further than I’d ever gone before. When my legs were feeling tired, it helped keep my spirits buoyed by reminding myself how much I’d already won at that point. The drop backs every other week were helpful for my personal schedule, in that it can be hard to get in long runs when I’m on call. It also helped to work around travel and other days when run time got crunched. My only injuries during this training cycle were due to general clumsiness, not anything directly run-related, which is a testament to the wisdom of a slowly increasing plan. This plan didn’t call for any speed work or other specialized runs, which was helpful for a true novice. It was intimidating enough every time I had a step up in mileage – knowing that I just had to cover miles was enough. I think I would have been too intimidated to stick to the plan if I was worrying about how fast I was running in addition to how far I was running. The Higdon plan called for a one week taper, but I chose to do two weeks and I’m glad for that choice. I’m the kind of person who is more likely to push too hard, so I don’t want to risk over-doing it so close to the race. Practicing my fueling and hydration before the race was so helpful. I didn’t worry on the course about whether I should have water or Powerade or how often I should take a Gu because I’d practiced all of that on my long runs in the few weeks before the race. Minuses: I confess these are all my failures/issues, not the training plan issues. I did not do a great job with strength training, despite the numerous times I set that goal here and the research I did that told me how truly important it was! This was specified in the training plan but I tended to focus on the runs, not the other boxes in the training plan. If I truly want to meet a bigger goal with the Des Moines half marathon, I’m going to need to work on that more rigorously. 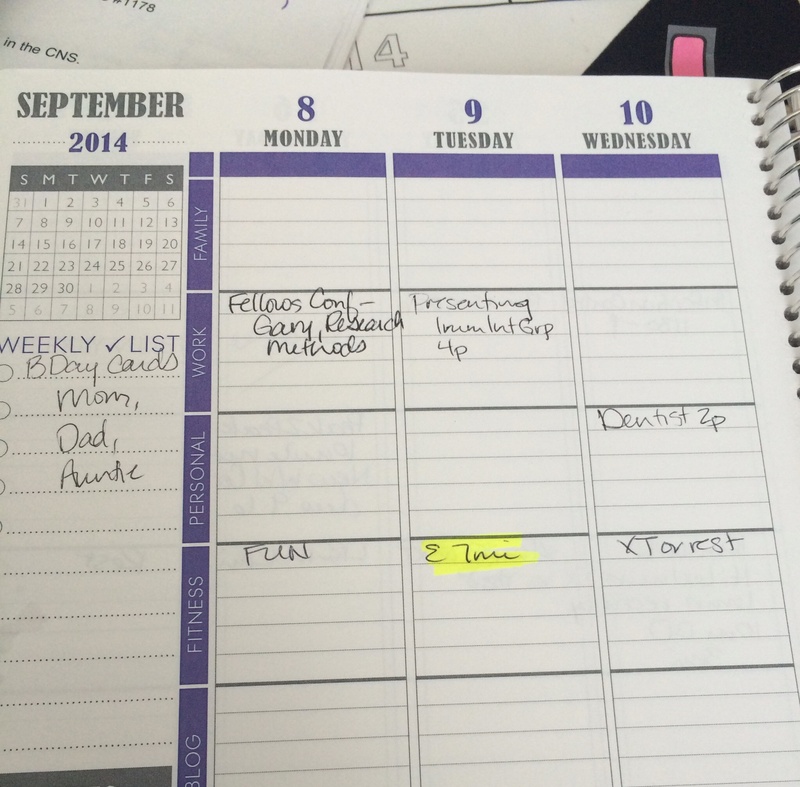 By the end of the training cycle, I was burnt out from being on a training plan. That’s not surprising since I had essentially been on a training plan since August, between the 10K and the half marathon. I don’t know that I needed a drop back week quite so often. I think next time, I may schedule that for just weeks I’m on call or traveling, and then maybe allow a couple of extra weeks overall to stick in a light week when I need it. I was really flexible about what days I did each workout, which sometimes resulted in running 5 miles back to back on the weekend or trying to put in an extra run after my long run. That was okay and I came through it safely with the first training cycle, but looking at more speed work and other high quality runs in the next training cycle, I need to try to respect the spacing of workouts a little more. I haven’t decided yet if I’m going to step up to the next Hal Higdon half marathon plan or go to a different plan (currently reading the Train Like a Mother half marathon plan), but I’ve got plenty of time to decide. Overall, this training cycle was a good experience, resulting in me crossing the finish line feeling good enough that I’ve already signed up for another half marathon. I’ll keep you posted about what training plan I choose and what new goals I set. Do you tend to stick with the same training plan each time you run a given distance or try out different options? 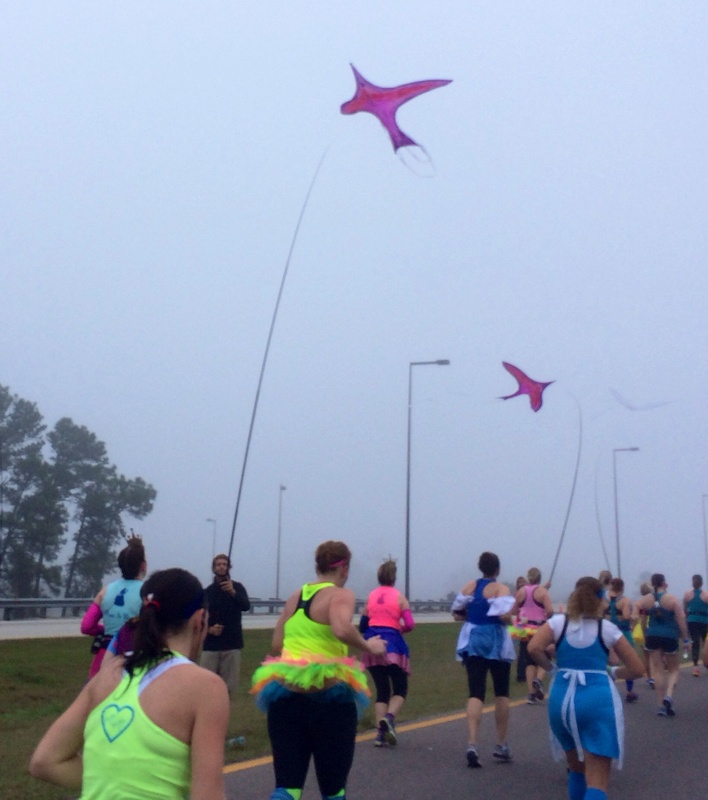 Friday Favorites: Basking in Race Recaps now that I’m back in the real world! 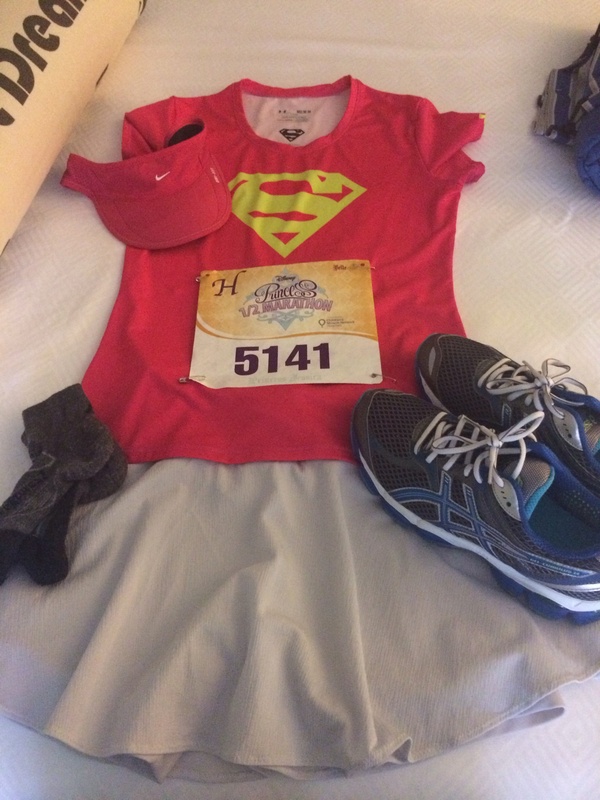 Everyone has recovered enough from the adventure that was the Princess Half Marathon to start posting their race recaps (mine are here and here) and I’m loving reliving the weekend through everyone’s stories! 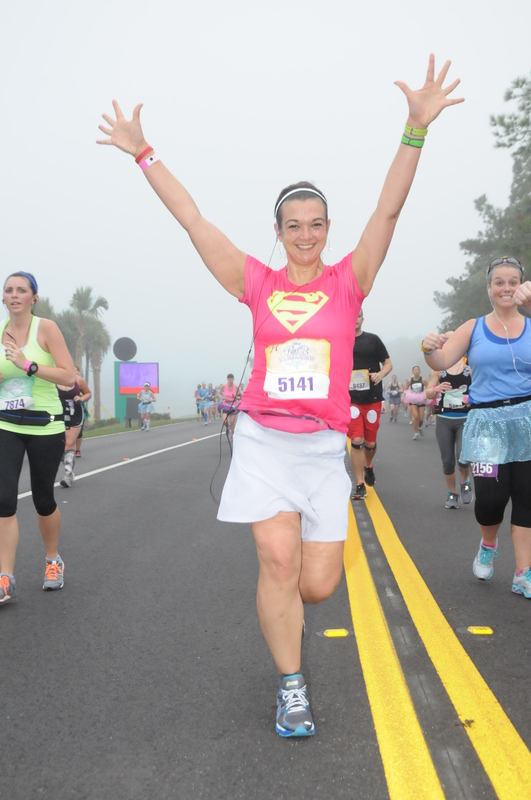 I get teary reading about people who struggled through pain to cross that finish line (Meranda and Karen!) 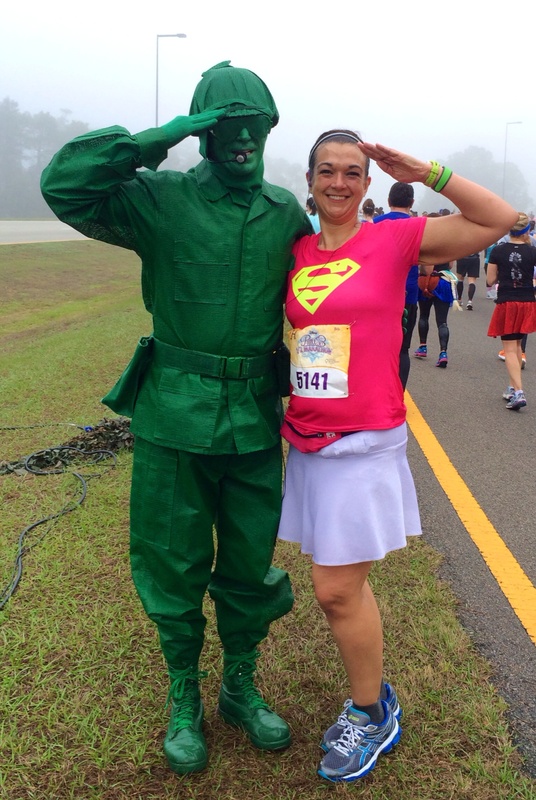 and find myself wanting to go do the whole thing again when I see pictures of characters I didn’t notice along the course! 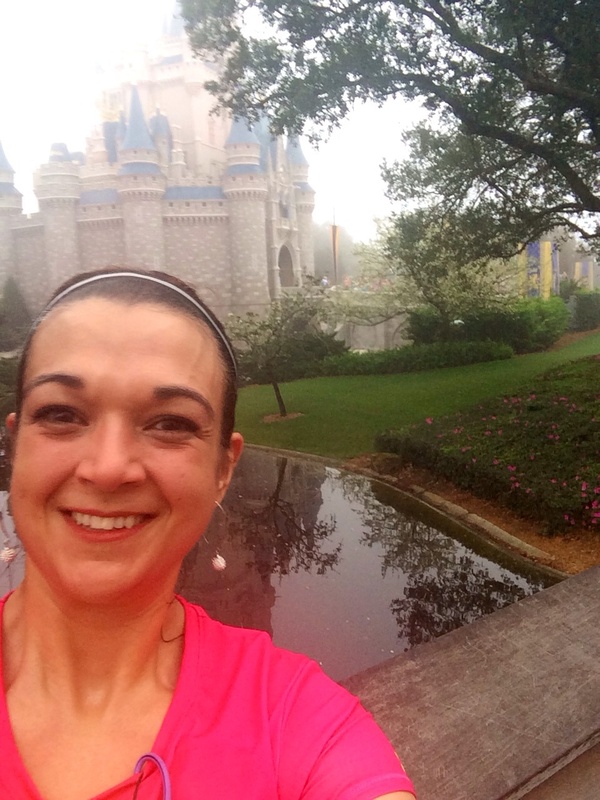 I found myself nodding along with Erika’s ownership of her Garmin time rather than the RunDisney time and cheering as I read her story. 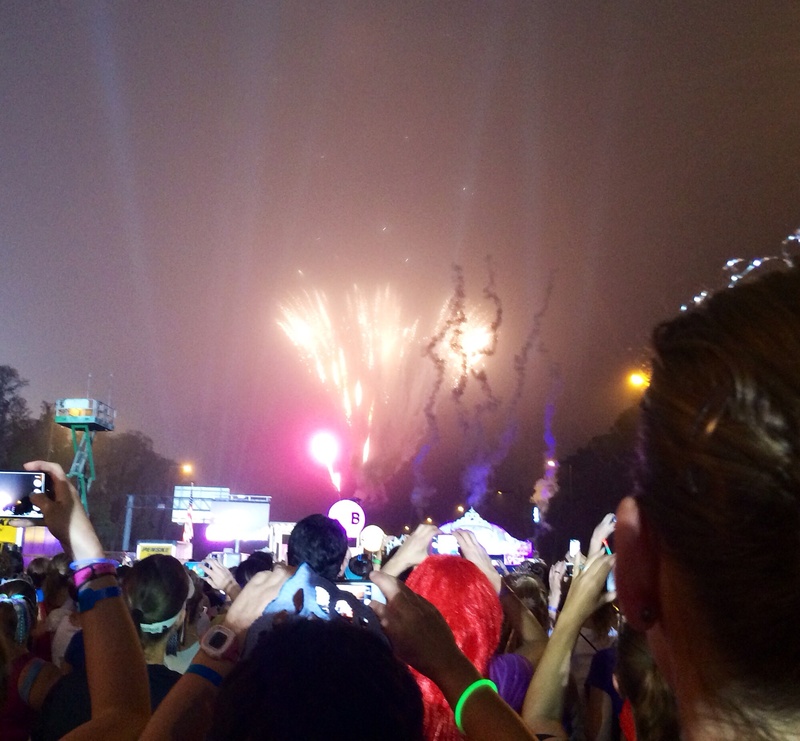 Meg & Kristy’s recaps of the 5K made it sound fun enough to ALMOST be worth the insane RunDisney price for 5Ks. 🙂 I am amazed at how this experience and social media have left me feeling like I know these lovely women and that we were all cheering for each other along those 13 miles. That makes we want to go back again year after year, because there is too little of that kind of camaraderie in this life. It was an honor and a privilege to run with you all! Fruit, oatmeal and frozen butternut squash are a far cry from the old days but we’ll probably live longer, right? 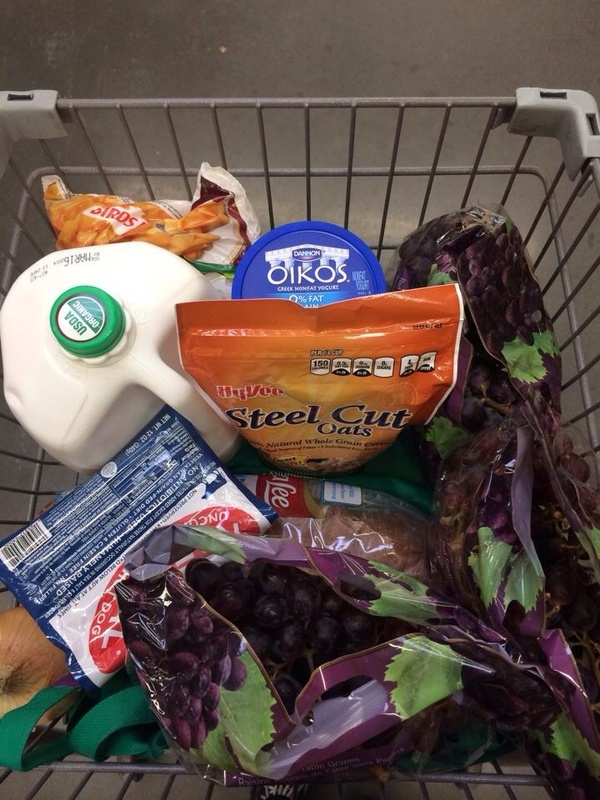 If you’re starting out and trying to figure out what to put on your “healthy” shopping list, check out this article from Spark People on Shopping Cart Essentials to get some ideas. I’ve talked before about the unexpected pleasures I get from Runner’s World – I seriously never thought I’d be someone who read that magazine! Whether you or not, I think all of us should read Lauren Fleshman’s outstanding and insightful essay about body image and the struggles all of us, even an elite athlete like her, experience. I find myself thinking things about my saggy belly pouch that I would never allow someone to say about someone I love – why do I talk to myself like that? (It would help if O wasn’t so fascinated with it and didn’t keep grabbing my belly flap to play with – Grrr!). Finally, as I find myself reflecting on what finishing a half marathon really means to me, I am awed by all that running has brought me. I love the Mizuno posting “What if everybody ran“. I don’t think running is something everybody has to do – don’t be afraid to try it, but ultimately find whatever brings you joy. 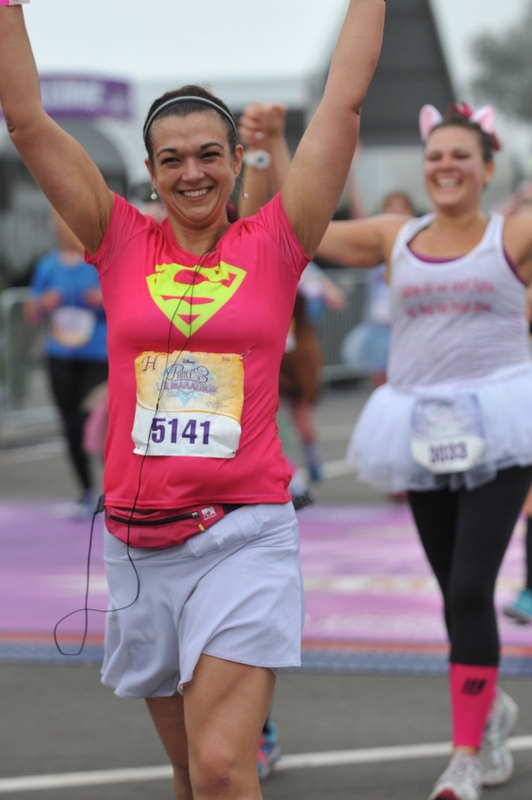 For me, running definitely brings me joy and the “37% more smiles” from their posting is definitely true for me! I also just noticed I hit over 200 posts this week – thanks for keeping me company guys! This started as talking to myself and now I get to talk to all of you too! Looking back at my goals for February, I’m not sure I actually did so well even though I met a big life goal in crossing the finish line of my first half marathon! 1) Safely get to PHM: I did get there, but between crashing and bashing my knee early in the month and then breaking my little toe the week of the race itself definitely wasn’t the safest route to get there! My toe is still sore (and I’m resting it until it has healed up) but at least my knee is back to normal. 2) Work on channeling my nerves about the upcoming race with something other than food: I feel like I did really well with this. It was a really busy month, so I was honestly too distracted to go off the deep end with regards to food. I tried to be thoughtful about appropriately fueling my body for the run, which meant I was constantly having conversations with myself about my choices and came out it feeling good about myself and my choices, which is all I can ask I think. 3) Do not let thoughts about vacation keep me from doing my actual job: My actual job kept me so crazy busy this month (even on vacation – in case you ever need them, the Polynesian concierges are great about helping with things like faxing if you’re suddenly needing to sign urgent papers while on vacation!). I feel like I did actually do the work I was being paid for (and then some given the amount of work I did on vacation! ), which has definitely helped me feel less behind now that I’m back at work. After crossing a really big goal off of my list last month by finishing the Princess Half Marathon, my goals this month are all small, fun and fluffy! – I want to ease back into running & figure out a good “non-training” workout week. I definitely want to keep regular physical activity as part of my routine because it’s good for me, it makes me feel good, it’s fun and I don’t want to lose all of the strength and endurance I’ve gained. I’ve got to confess that I was getting a little burnt out on the training plan though, as far as having to run “x” amount of miles “x” days a week. It definitely took some of the fun out of it. I’m looking forward to running for the fun of it again! With my poor broken toe (definitely much more sore after the Disney endorphins have worn off! 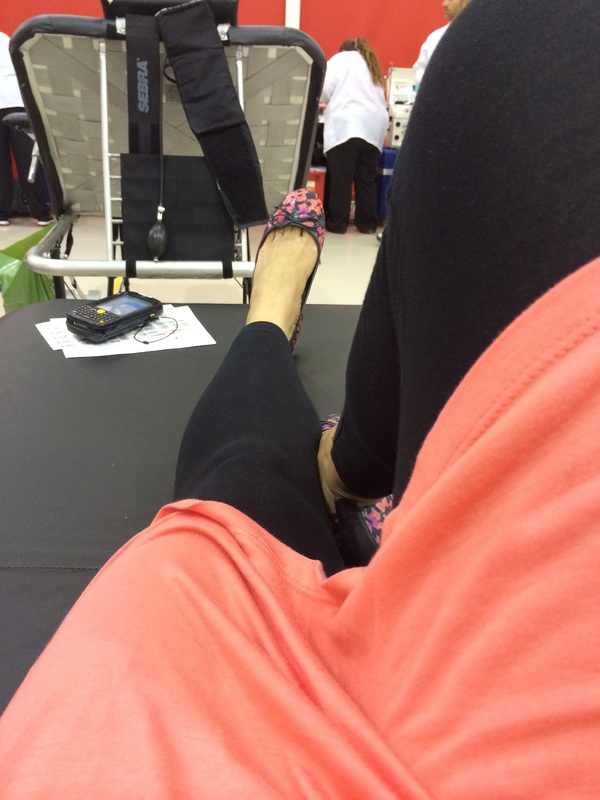 ), I’ll definitely respect my body and rest up until that pain is gone, so no running for a while anyway. – In the interest of getting back to fun workouts, I’m going back to at least one Zumba class this month! Until my toe has healed up, my goal will be to get back to yoga classes at the gym once a week. – I won a glass fusing class in an auction back in the fall and I’m really looking forward to taking that class. I don’t have any weekends on call this month, so I should be able to get it in. 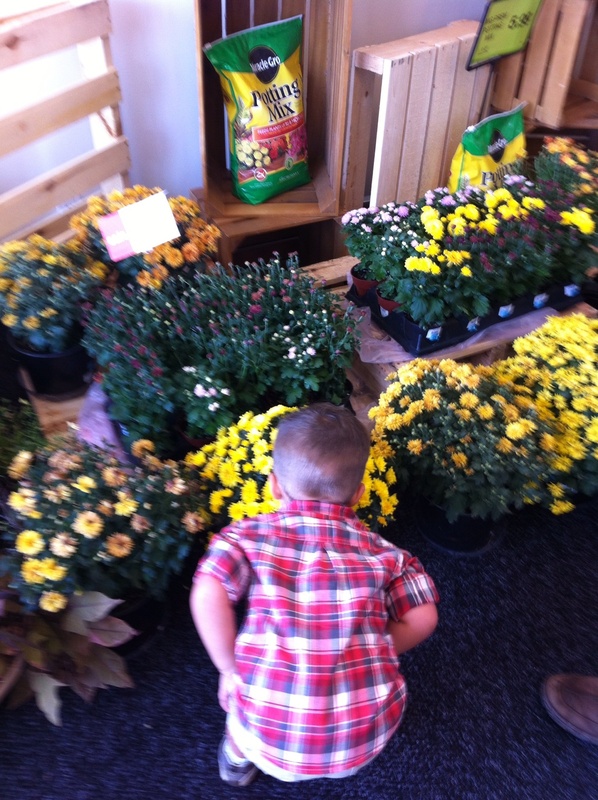 I’m looking forward to getting warmer, sunnier weather so we can get outside and play! I’m definitely feeling the need for spring! For Part 1 of this story, see yesterday’s post here. While I was in the Magic Kingdom, I took out my earbuds as there was so much music and cheering but I replaced them once I got back on the road outside again. Things got narrow again immediately after leaving the Magic Kingdom, while we were on a narrow stretch of the road (thanks to a thousand cones). 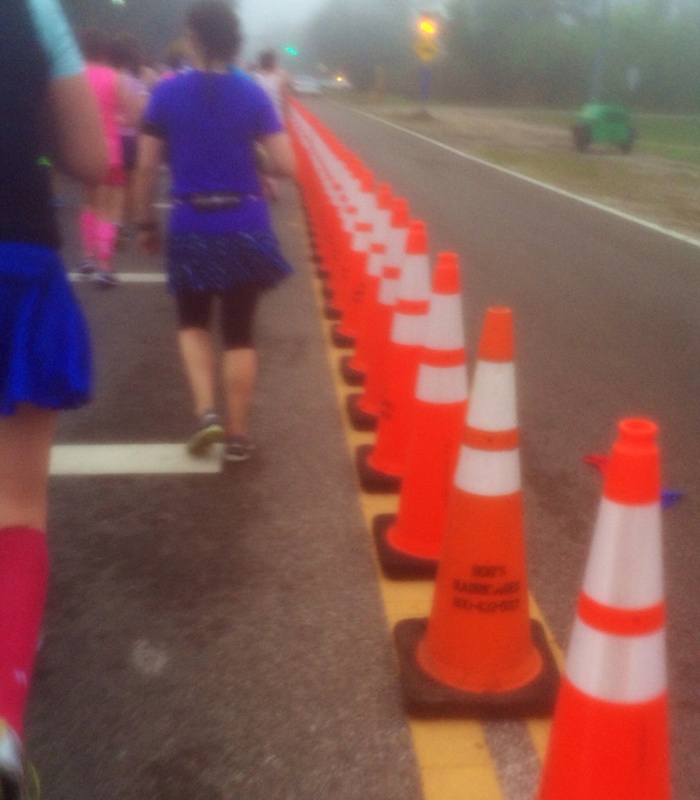 Someone is making a fortune on renting orange cones for runDisney events. 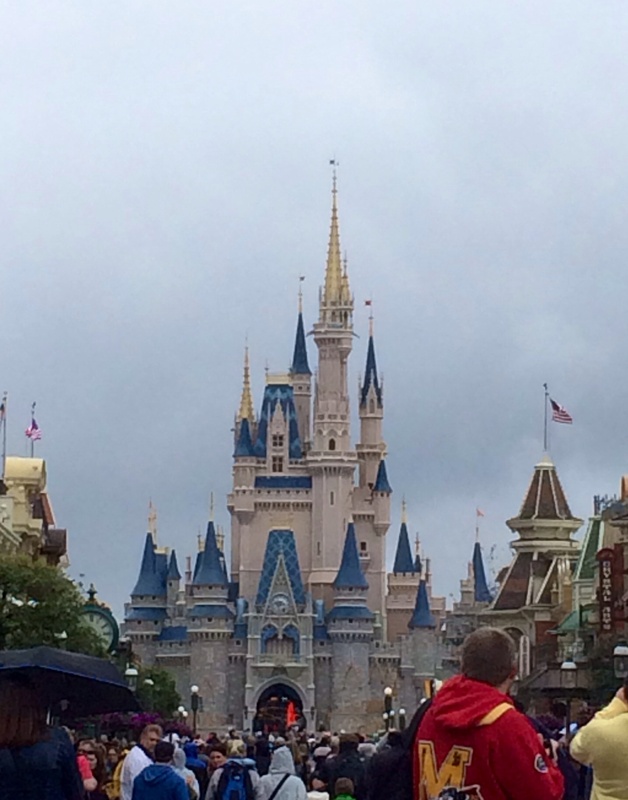 I was still on a post-Magic Kingdom high so I didn’t mind the congestion much. I did start stopping for walk breaks every half mile just to conserve enough energy for the rest of the race, but overall I feel the second half of the race went a lot easier than those first few miles. 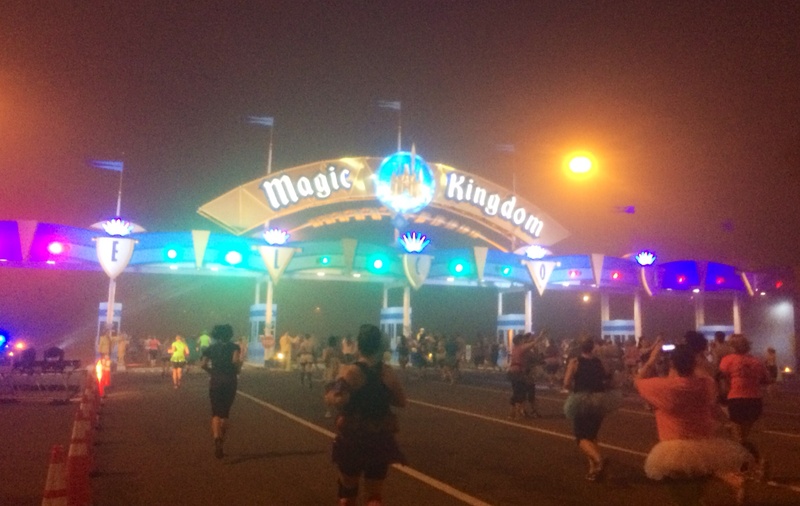 I felt like I had accomplished so much in running through the Magic Kingdom itself and finally had the certainty that I would in fact be finishing the race! At mile 7, they were playing “Let It Go” from Frozen and I really feel like I did let go of a lot of self-doubt in that moment. 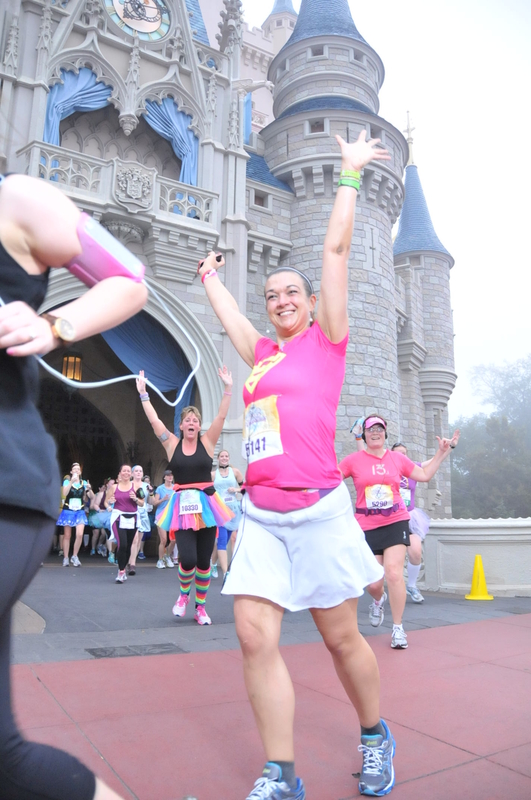 While the second half of the race is less exciting because it is just out on the road and you don’t have the high of the castle to anticipate anymore, I enjoyed it because there was so much less crowding. It was a lot easier to run and to chat with people. I found myself chatting with other “pink heart” ladies from the PHM Facebook group and listening to the couple running near me, in which the man was frequently offering encouragement and support to his running partner (I thanked him at the end – his cheering her on helped me immensely!). Thankfully he let me take a pic with him without doing pushups. It was damp down there! 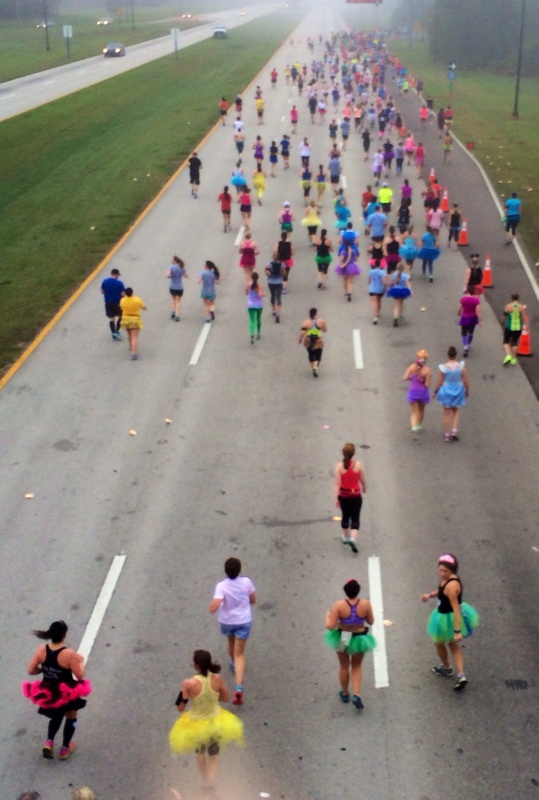 The overpasses did allow me to get some nice views of the course and the runners as well. Lots of tutus down there! They were gorgeous and I’m impressed with the arm strength of the guys who operated those for the entire race! We also passed a Hess gas station at one point and I cannot tell you how much I wanted a Diet Coke in that moment. A giant one. It was exciting to go up the last hill, knowing that Epcot was in sight at the bottom. I loved seeing Peggy, with the famous “Complete stranger I’m proud of you sign”. At that point, I was so excited to be on my longest run ever (incredibly motivating to remind myself of that every step after mile 11!) and so close to the finish, I didn’t work my way across for a picture with her or to say thanks but she really did help me feel like I’d succeeded. Coming around a corner into Epcot, I was surprised to come across Princess Sofia. 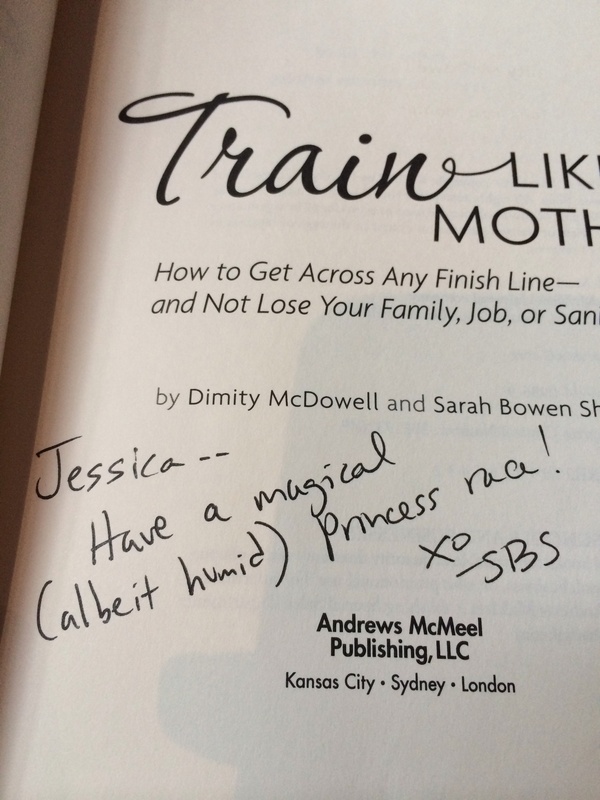 Her line was super short and from my conversation with the women around me, full of mothers of toddlers as we were the only ones who realized just how cool she was (that amulet lets her talk to animals!). I stopped for a quick little walk break at this point so I had the oomph to run across the finish line, which I knew was just ahead! Thanks to spectating the 10K the day before, I recognized the section of the course that immediately preceded the finish line and started scanning for my guys. I’d gotten a text from Darrell to let me know that he and O were in the stands waiting for me. 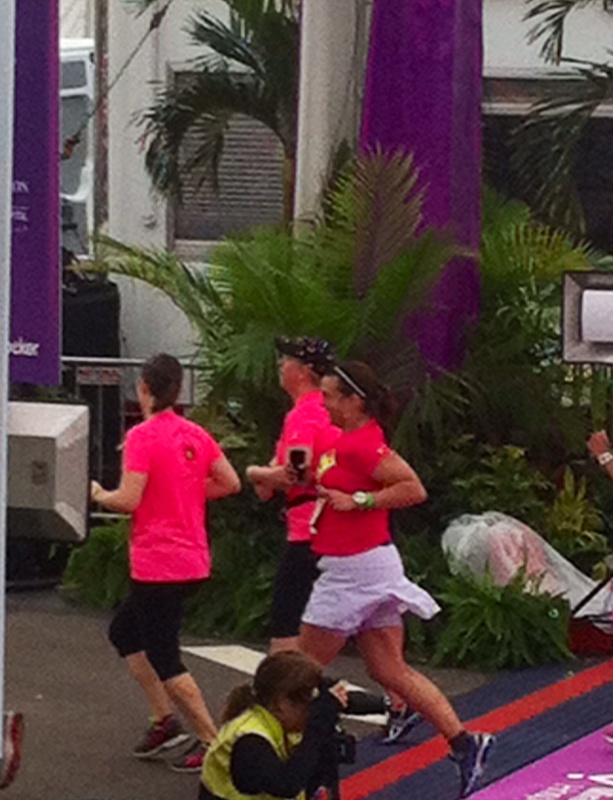 I never saw them, but they saw me and my husband was so proud that he got a photo of me crossing the finish line. 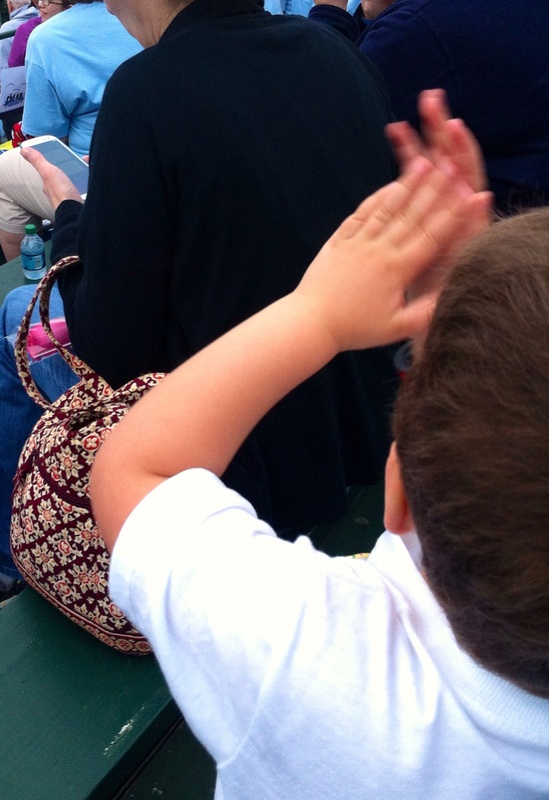 He and O had sat and watched finishers for a while, with O clapping wildly the whole time. It’s easy to get him to go along with celebrating (that’s why he comes to Weight Watchers meetings with me some days). After crossing the finish line, there were lovely ladies with wands sprinkling glitter on our heads as we passed and then it was on the medal. I asked one of the volunteers to take my picture with my medal as I expected O to take it from me as soon as I met up with them again. I’d done it! I had finished a half marathon! 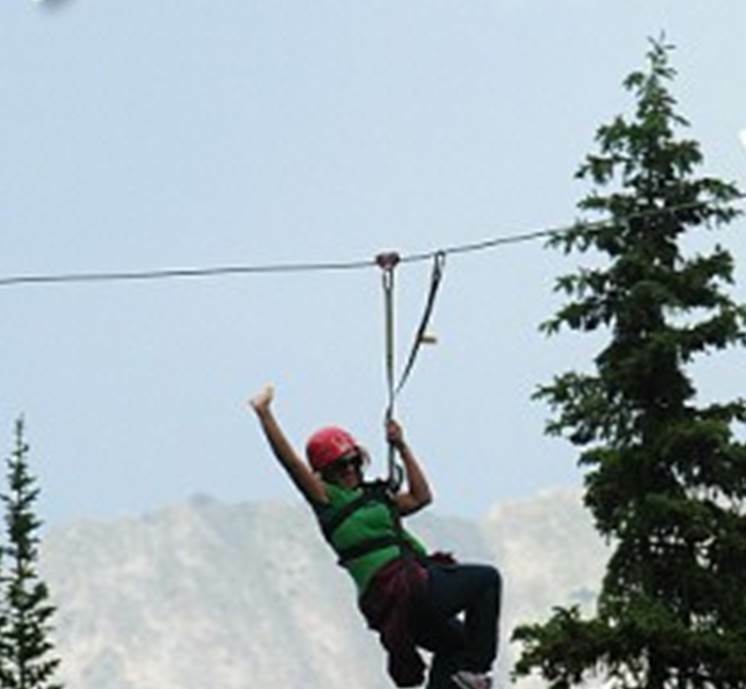 I still have to remind myself of the enormity of it because it was so fun (and recovery has gone so well) that I tend to minimize what a big deal it was. 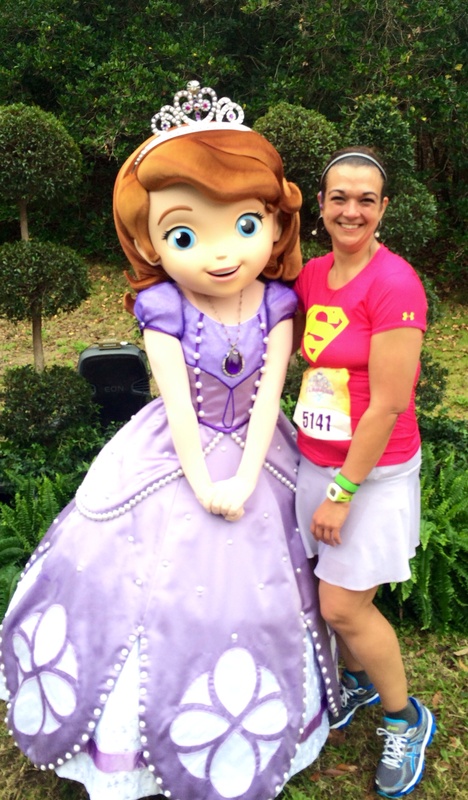 I would absolutely recommend the Princess Half Marathon as a first half marathon for anyone who is new to running. It’s low pressure, not competitive and a really supportive environment. There’s a good mix of runners and walkers (and lots of run/walkers) and for the most part, everyone was polite about letting others do their own races in my experience. I’ve seen a lot of chatter on social media about people being rude to walkers or people feeling crowded by people passing them, but I only encountered one person with a noticeably bad attitude toward walkers (and really, if you don’t want to deal with walkers, submit a time that gets you up in a higher corral or don’t stop for so many things that you fall behind your pace group!). I think passing is something that’s going to happen in a race like this, with so many people moving at so many different paces. There were definitely times I passed on the grassy shoulder because there wasn’t space anywhere else, but that didn’t bother me and I didn’t mind having to pass around walkers because I knew someone would have to pass around me when I was the one walking. I noticed a lot of people using hand signals for when they were planning to slow down to walk, which helped a lot. I just tried to look around me when I was moving over to the side to walk and to be aware of anyone in my immediate vicinity when I slowed down. I did nearly plow one poor lady down because I didn’t realize she was stopping to film the gospel singers for a while, not just to take a picture and she didn’t move on when I was anticipating! Oops! For the most part, everyone seemed to play well together. As far as the humidity was concerned, I ended up being really glad I’d done all that research about how to handle it and tried to put the things I’d learned to use. I stopped at every water station offered (and runDisney had provided a lot of them) and took water (not Powerade as I hadn’t trained with that and didn’t want to try anything new race day). For the most part, the Powerade was in Powerade cups and was offered first, with water further down the aid station. There was plenty of both at the times I came through and the volunteers were quick to answer if you asked which they had. I dropped my anticipated pace down to 12 minute miles (instead of the 11 minute miles I’d trained at) so I didn’t overheat and took more walk breaks. All of that helped me finish without feeling overheated and I tried to drink my water with Nuun aggressively for the rest of the day. I did hear that one runner got hospitalized for heat exhaustion, which was definitely a risk with that kind of humidity. At the end of the day, I’m incredibly glad I did this and I’m definitely going to run another half marathon to see what I could do on a less crowded course, without a broken toe and with less humidity! 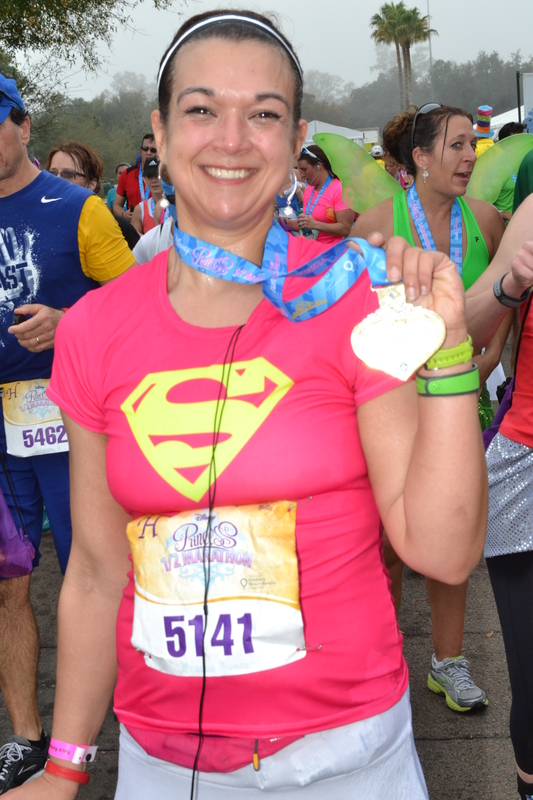 This was about proving to myself that I could keep up with running, that I could maintain my weight loss and that I could achieve a big running goal in running 13.1 miles. Check, check and check. There is nothing more that I could ask! Thanks to all of you for your support along this journey! 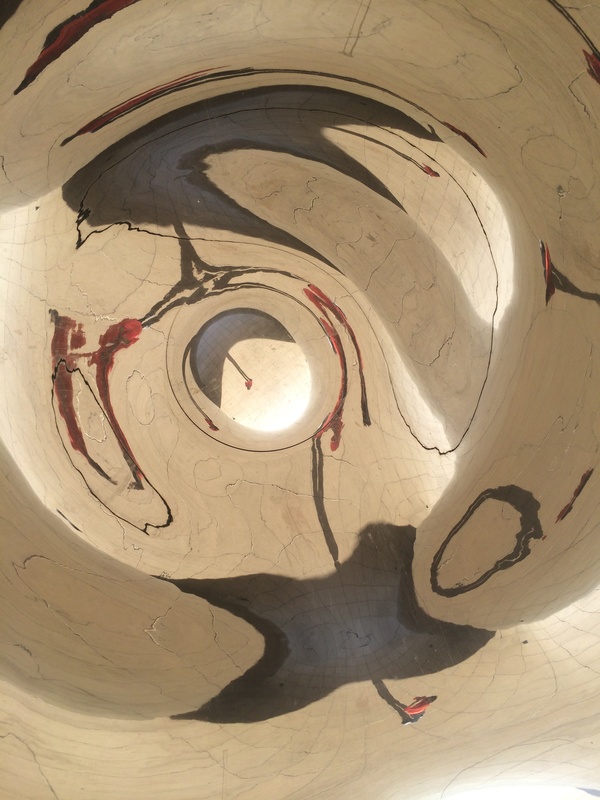 Just thinking about trying to recap this experience is a little overwhelming, because there was so much (and thus will be split into two posts)! 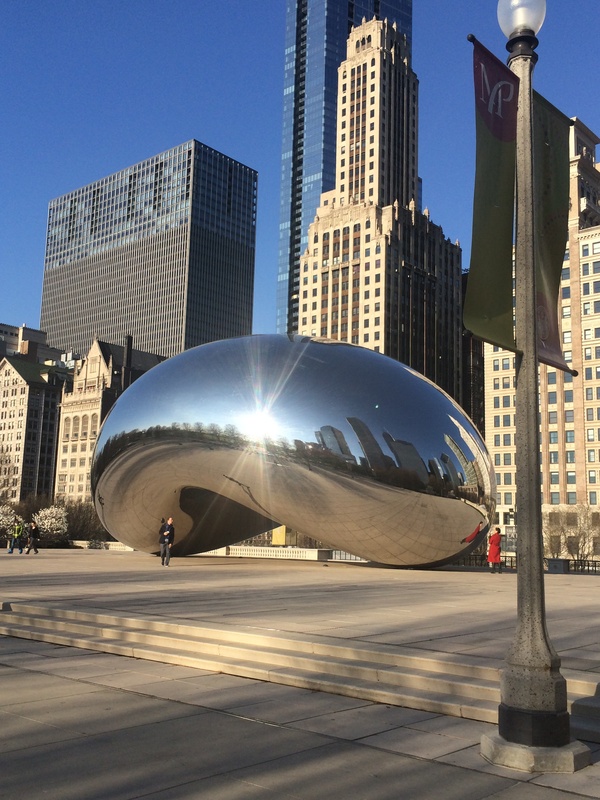 I’ve already talked about spectating the 10K and Kid’s Races, the Expo and the Race Retreat, so check out those posts from last week for more details on those parts of the weekend. I find myself thinking back to the day I signed up for this race, back on a warm summer day sitting on my deck. I’d just made Lifetime status at Weight Watchers and wanted a new physical activity goal to help me keep on track. All of the statistics you hear about maintaining weight loss are pretty dismal and I did not want to regain the 110 pounds I’d just spent a year losing. I was doing well on my goal of running four 5Ks for the year (3 done) and had just run 4 miles, a new long run record. 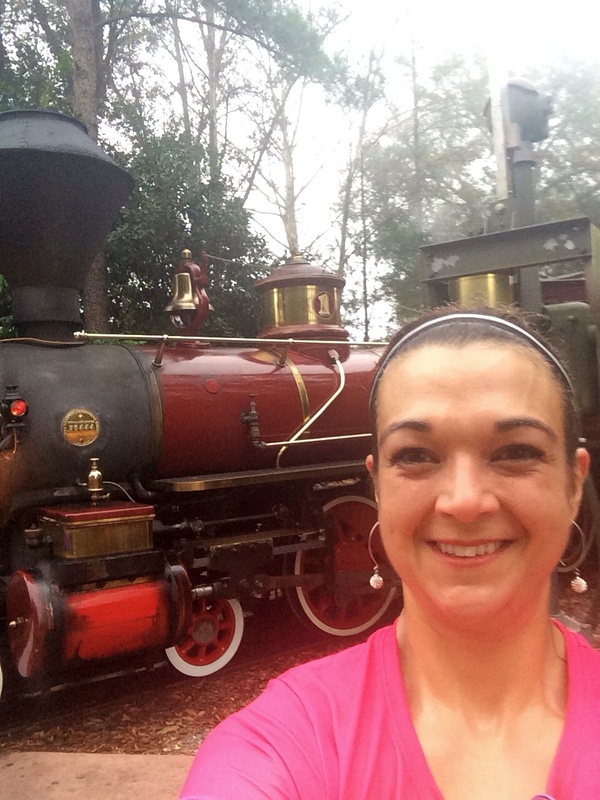 I was toying with idea of trying to run a 10K and looked at the runDisney races just out of curiosity as Disney is our happy place and running the Castaway Cay 5K was a very good motivator to keep me running when I’d first started. 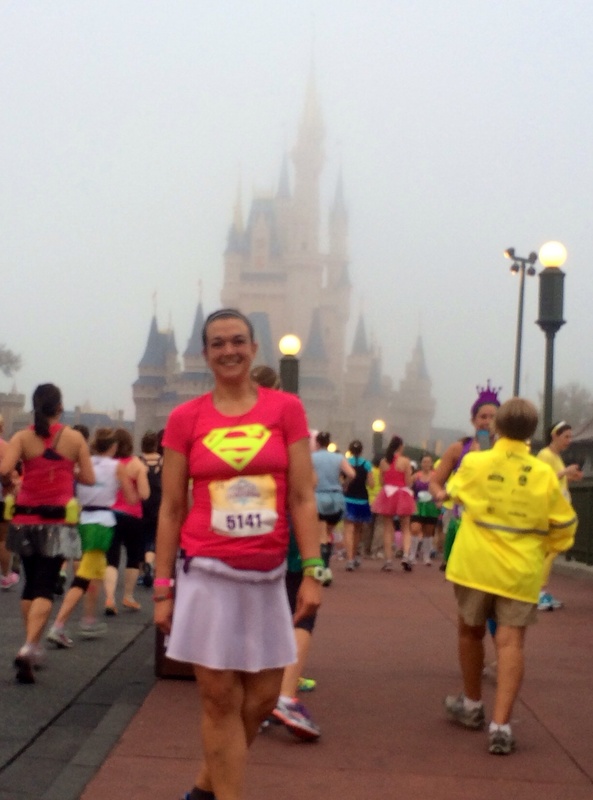 What better setting than Disneyworld for a new goal race, right? 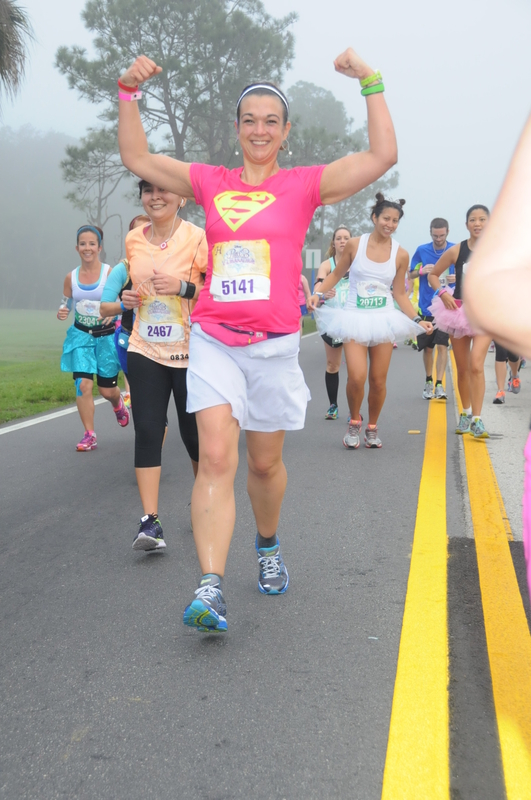 The 10Ks at Disney were all sold out, but there was still some space in the Princess Half Marathon. Somehow I convinced myself that 6.2 miles and 13.1 miles weren’t that different, so if I thought I could run a 10K, I could run a half marathon, right? 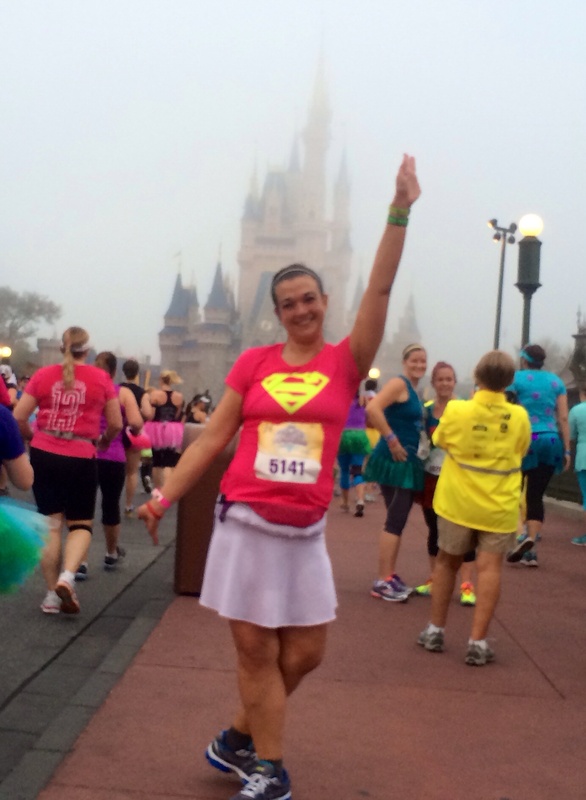 When I arrived in Florida and saw the first Princess Half Marathon sign in the lobby of the Polynesian, I found myself thinking back to that sunny day on the deck when I committed to this journey. I couldn’t believe I was actually about to run a half marathon, that all of those months of work were about to pay off. 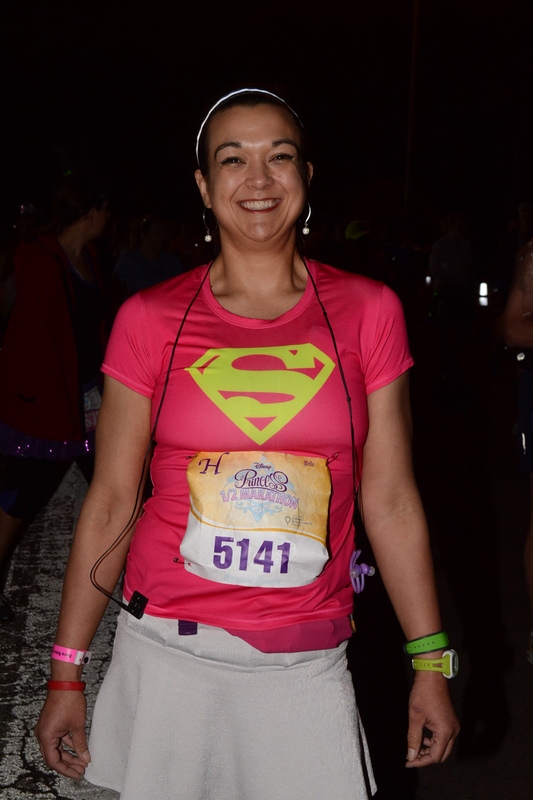 I spent Friday night settling into the room (lots of baggage comes with a 2 year old on vacation for a week) and Saturday spectating some races and meeting up with a friend at Hollywood Studios before hitting the Expo. Darrell & O arrived Saturday afternoon and we went to Epcot to ride Nemo and hit Via Napoli for dinner (full restaurant reviews will come later). After such a full day, it was surprisingly easy to get to sleep that night at around 9 o’clock. Thankfully Darrell had O in bed with him so I slept like a rock until I woke up at around 2:15 (before the alarm clock, which was set for 2:45!). I’d set up all of my gear on Saturday afternoon before my guys arrived, so it was easy to get everything set to head to the starting line. Ready to go! Pre-race selfie! 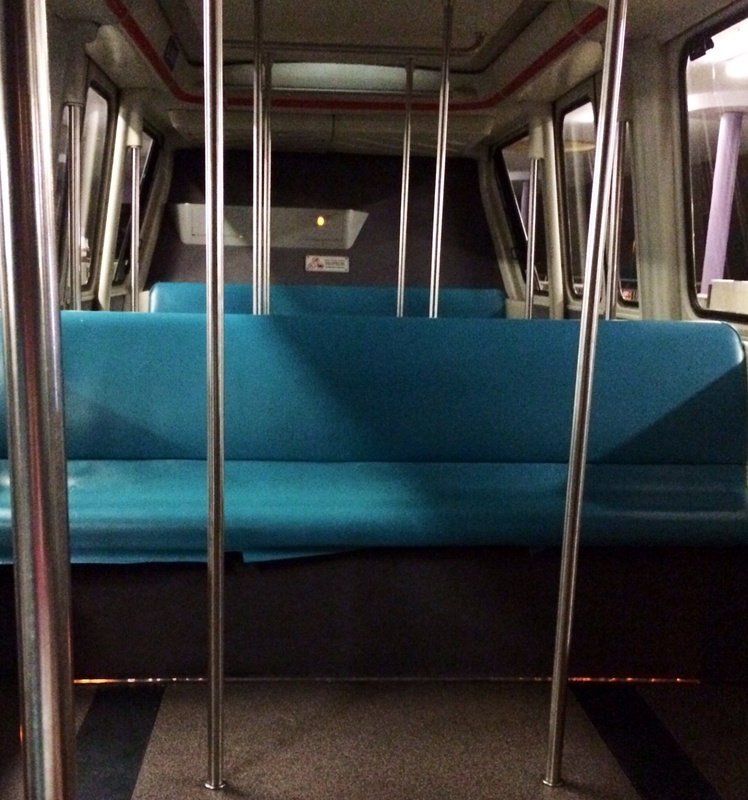 I walked from my room to the Transportation and Ticket Center (a perk of the Polynesian) and was the first and only Princess on my monorail. I got lots of encouragement and cheers from the cast members on the monorail, which was nice, including a shout out over the PA system when I got off the train. After going through the gates, I started the LONG walk to the corrals. The nice thing about all of the walking was the chance it gave me to warm up and settle my nerves. It also helped me realize what 26,000 people really looks like! 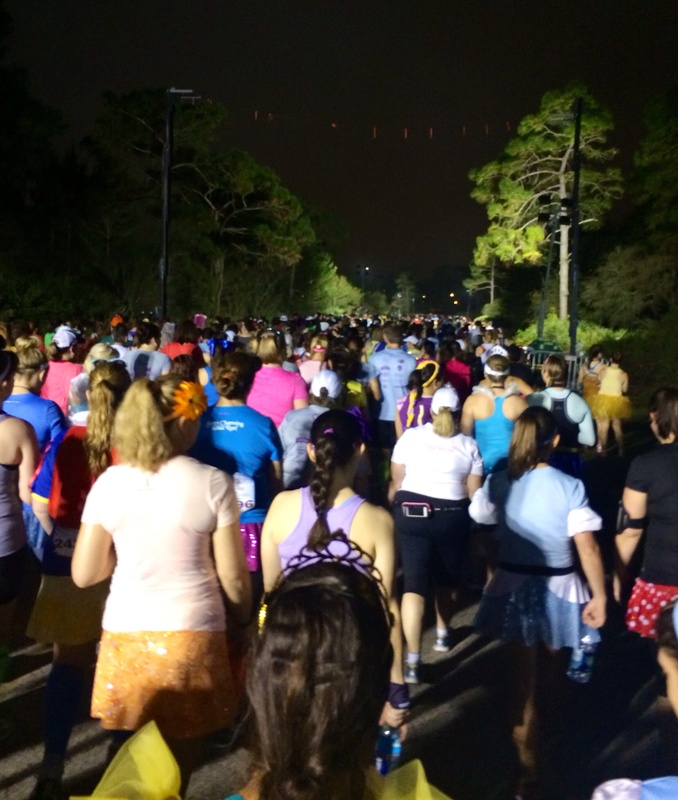 The runners split into two paths to get to the corrals and there was another big bank of port-a-potties near the corrals (as well as lots of princesses squatting in the woods). Given the length of those lines (and my desire to avoid having anything stick to my already sweaty self by squatting in the woods), I decided to skip a second pre-race pit stop. I was nervous about missing the start! I enjoyed listening to the chatter around me at the starting line and also enjoyed not actually having to make any conversation myself since I was alone (fellow introverts will understand – conserving mental energy!). Before I knew it, the first corrals were starting. Things seemed to move very very quickly! I’m not sure how long there was between corrals officially, but it seemed like it was only a few minutes at the beginning. Faster than I could imagine, we were off! It was incredibly crowded for the first two miles and I felt like I was constantly trying to pass people to find some space to run. It was so crowded I didn’t see a water bottle someone had left in the middle of the road and stepped on it, squirting another princess. Sorry! Those first two miles felt so slow and hard. It was so humid that I was immediately soaking and hot and my left foot was really bothering me in those first few miles. 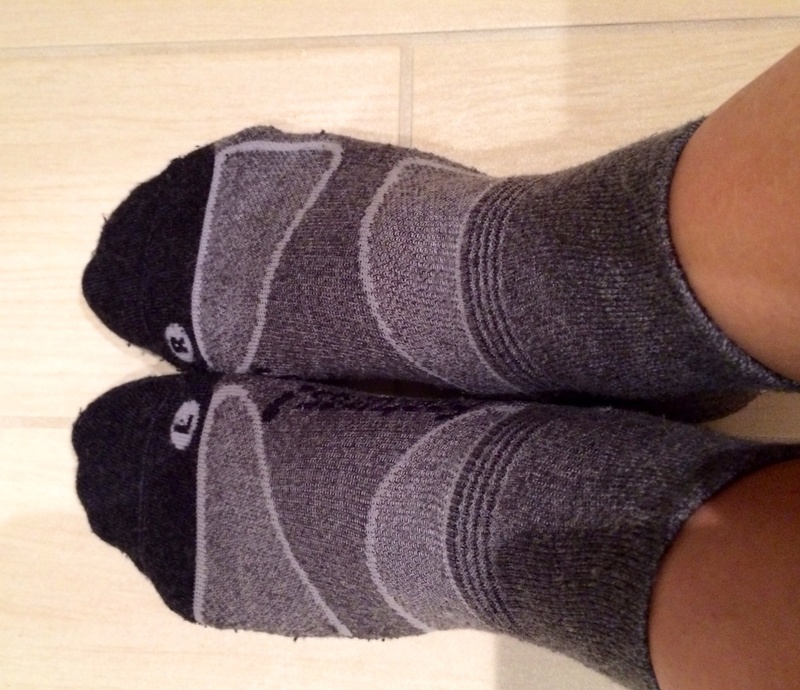 In the first mile, my little toe hurt, which I was expecting, but after that it shifted to pain in the base of my big toe. I suspect that was because I was altering my gait to account for the broken little toe, but regardless I ended up feeling like there was nowhere on my foot that wasn’t hurting when it struck the ground! I also ended up stopping for a pit stop between miles 1 and 2, which was frustrating but necessary. 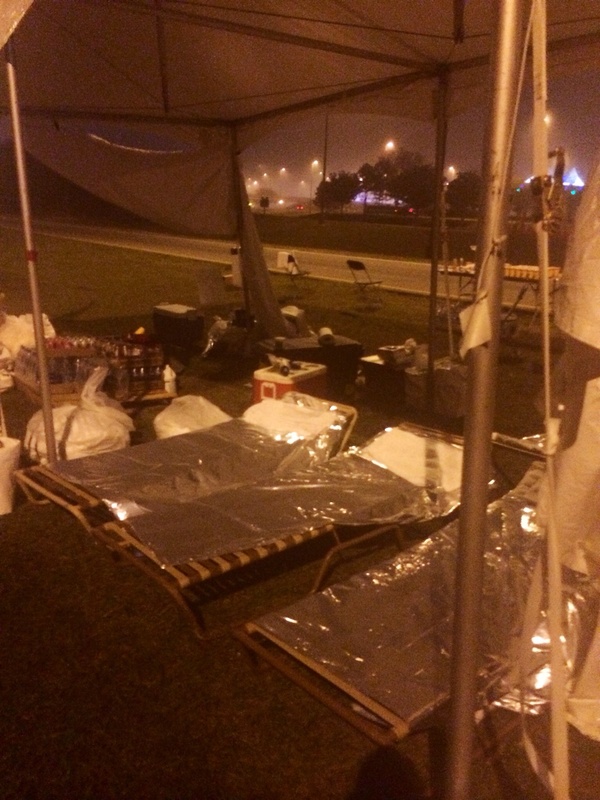 I did get to check out the first aid tent while I was waiting (port-a-potties and a small station of water at the med tents). They look well equipped and people were already grabbing Biofreeze very early in the course. I think I was there for about 5 minutes, but it felt like an eternity! I kept reminding myself that a) waiting now was better than an accident later and b) I really wasn’t worried about time – I was worried about finishing safely, so 5 minutes now didn’t hurt. When I rejoined the course, I spent a lot of time passing people again until I got back up to a more open part of the course. Once the character stops started, it seemed like things spaced out quite a bit for the most part as more and more people were stopping for photos. I decided to stick with my plan for character photos, stopping for things that O would like to see. That meant I didn’t stop for the long line for the princes or the villainesses, although I did get pictures of the groups as I passed. There were lots of cast members cheering us on (and warning us about the speed bump) at the Magic Kingdom sign, which was about the point where I started getting really excited about what I was doing and started forgetting about the humidity and my foot (and my lost time at the potty stop). That haze would be the warm fog we were running through. Of course, I’d forgotten that it was still a couple of miles after this sign before we entered the Magic Kingdom! 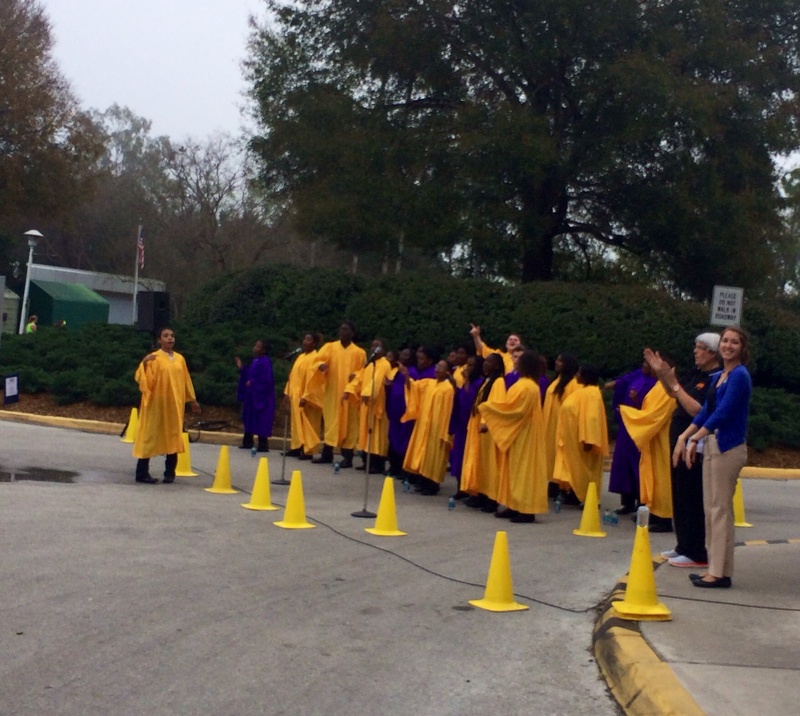 We passed our first big group of spectators between the sign and the Magic Kingdom itself, which was exciting. My favorite sign (which I saw several times along the course – that guy was getting around fast!) said something to the effect of “My princess said I had to make a sign. Here’s your sign.” It made me smile every time I saw it. We passed the race track and there was a photo opportunity with race drivers and a couple of cars, as well as very motivating “vroom” sound effects from the track and then we were heading into the park itself. We approached Main Street via a back stage area, so we were almost upon it before I realized it. It was incredibly narrow getting down Main Street because more than half of the street was roped off for spectators. 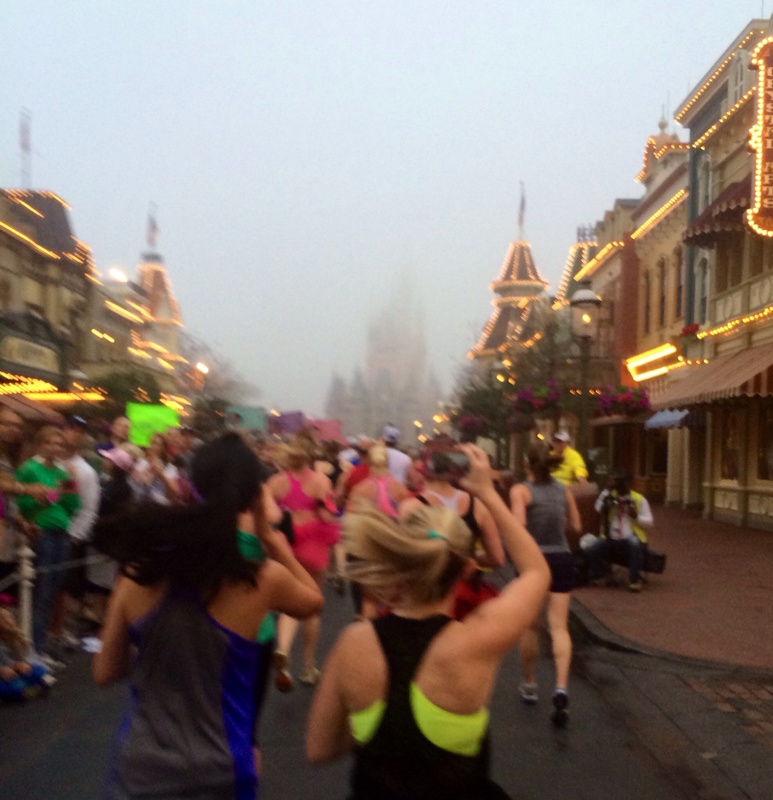 It was so foggy you could barely see the castle (and I love that one of my official MarathonFoto pictures from Main Street is of me holding up my iPhone to take this photo). When I got near the circle in front of the castle, just before the turn into Tomorrowland, I stepped off to the side and asked a cast member to take my photo in front of the castle. 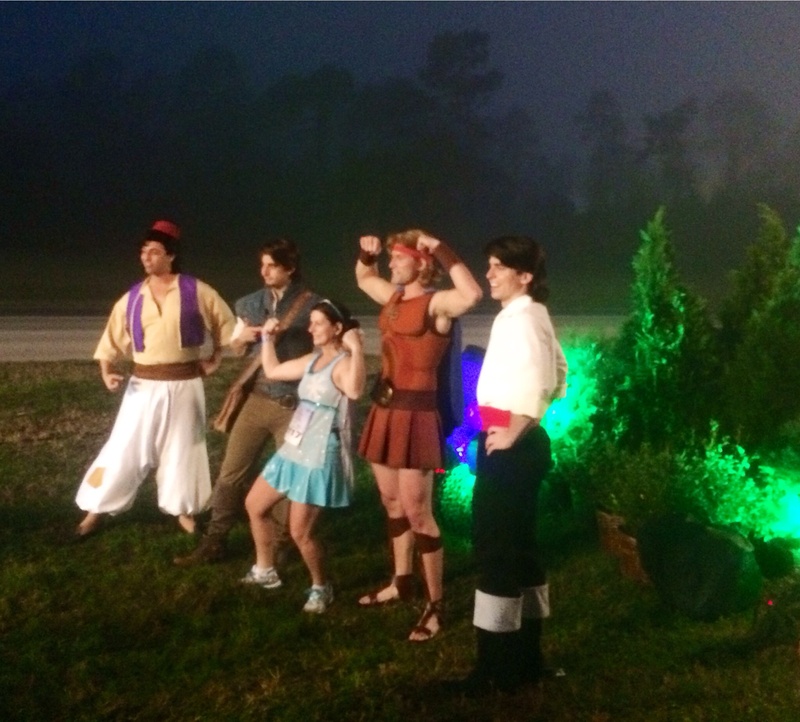 I love how into the spirit of things the cast members were (and how lumpy the Gu’s made my waistline look!)! As I got into Tomorrowland, I knew the Buzz Lightyear photo stop was approaching and it was one I wanted for Oliver. Fortunately, when I got there the line was really short as Buzz was out for a break and heading back in the next minute. They move people through the photo lines really quickly and before I knew it, I had a great photo and was off again. During my walk breaks (taking one every 3/4 mile at this point) I was texting the photos to my mom and my husband. 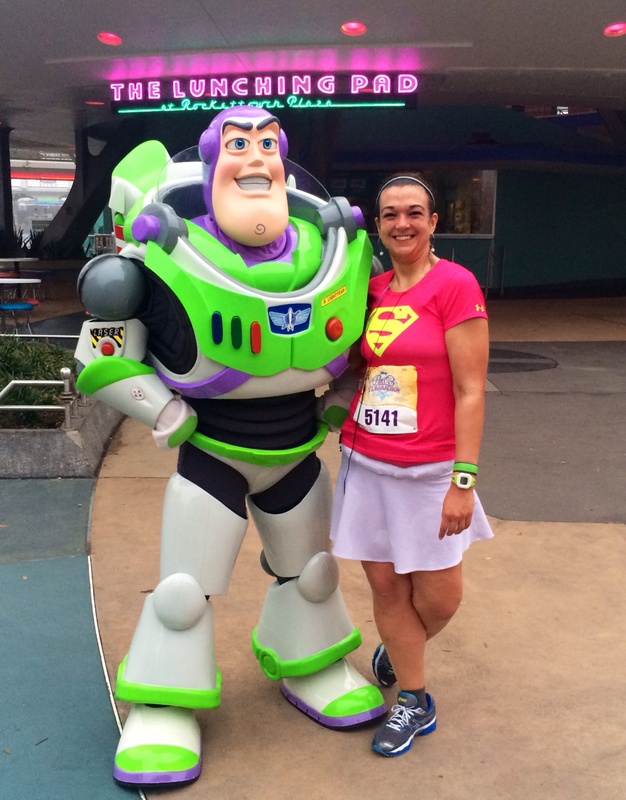 My mom was amazed at how happy I looked during all of the photos, but how could you not be smiling when you’re running a race where you get to stop for a photo with Buzz Lightyear? Coming up to the castle, I was excited that the crowd was moving quickly enough to actually run through the castle. There were trumpeters over the entrance to the castle celebrating our entrance and before I knew it we were running through! I really like one of my MarathonFoto pictures from that moment and it is also one of the places that MarathonFoto offers video footage of, so I have that as well. I’ll have a separate post with the race photos, once I get them downloaded. We continued through Frontierland (and every time I walked that section of the path for the rest of the week I thought “I ran here!”) and I skipped the line for Woody since he wasn’t actually out. The longest lines of the day that I saw were in the Magic Kingdom, for Mickey & Minnie and for Princess Aurora & Prince Phillip at the castle float. I’m not big on Princesses (weird for this race I know) and knew I had lots of Mickey & Minnie meetings coming with O at character dining for the rest of the week, so I didn’t stop for those lines. We headed across the train tracks and through a backstage area before hitting the road again.